DISCONTINUED TEMPLATES CAN BE AVAILABLE AS CUSTOM TEMPLATES. 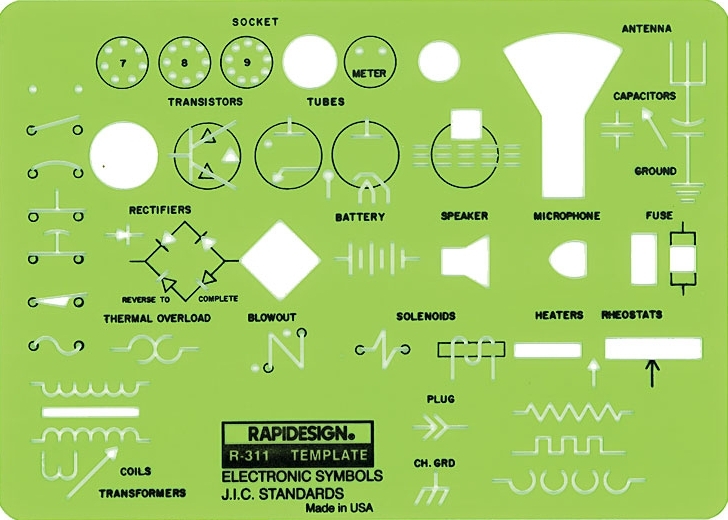 Symbols for the most commonly used laboratory recording instruments; manometers, relief valves, pressure gauges, indicators, signal lights, solenoids, etc. Developed by the Engineering Department, Instruments Section, E.I. DuPont Company. Size: 8" X 5". Thickness: .030". 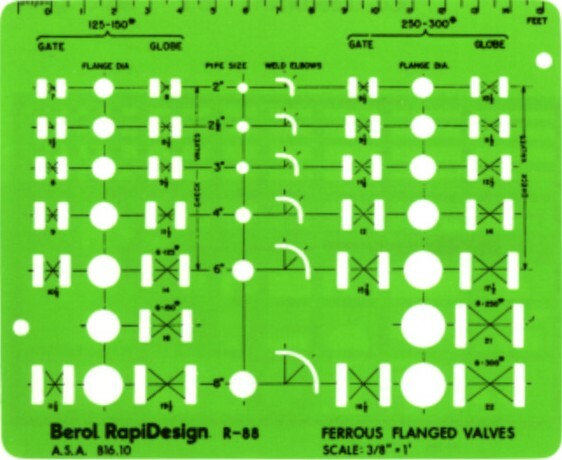 Symbols for pipe O.D., end bell, flange and fittings in 7 sizes and 6 scales: 1/8", ¼", ½", 3/16", ¾" = 1' scale. Size: 8" X 5". Thickness: .030". Scale: 3/8" = 1'. Conforms to ANSI B-16.10. Sizes from 2" to 8" pipe diameter, both light and heavy series. Size: 6 3/8" X 5 5/16". Thickness: .030". Pentagons, hexagons, heptagons, octagons, chair and boat forms of cyclohexane rings. Size: 6 7/8" X 5". Thickness: .030". 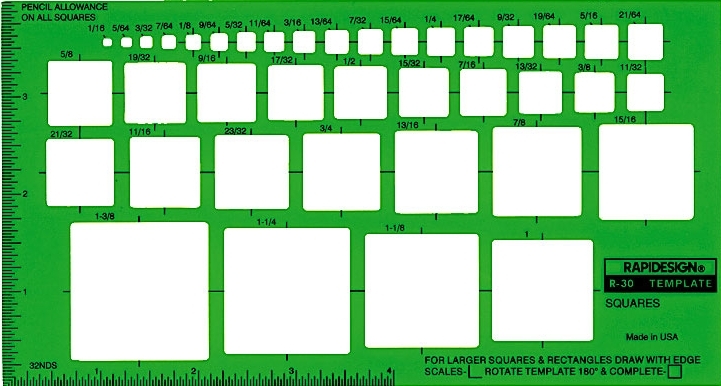 Range of templates from ¼" to 1: as measured across the flats. 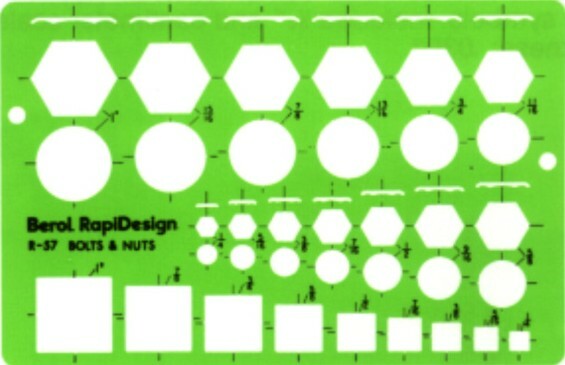 Contains 13 hexagons in 1/16" increments. 13 circles serve as tangent or chamfer circles for hexagons and bolt body diameters. 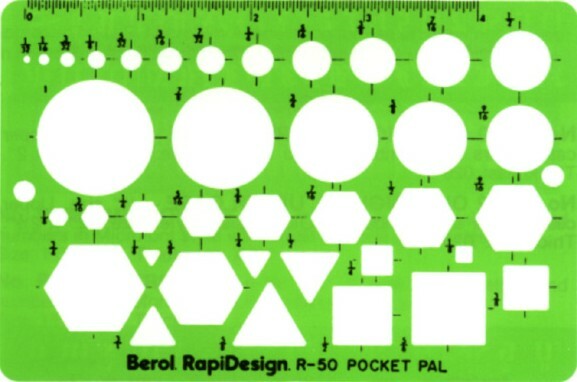 Includes 9 cut-outs for square heads and nuts. Size: 7 5/8" X 5". Thickness: .030". Scale: 1" = 1'. Size: 8" X 5". Thickness: .030". 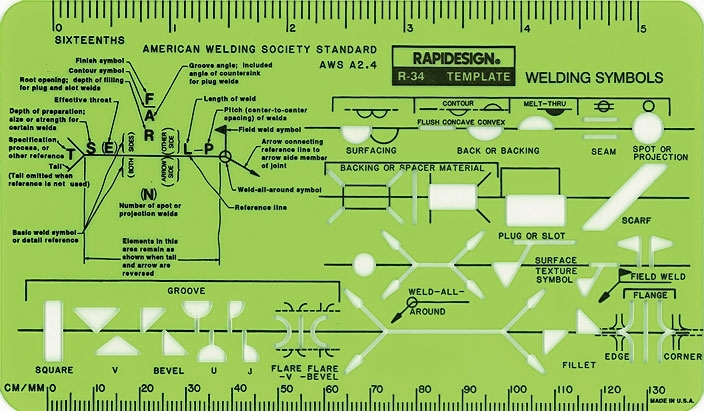 Standard welding symbols conform to AWS A2.4 specifications. Makes clear, accurate symbols quickly and neatly. Shirt pocket size. Size: 6" X 3 ½". Thickness: .030". Conforms to ANSI B18.3. Head and body diameter circles with hexes for Allen wrench. Cut-outs for elevation view of head, thread diameter and thread length of shoulder screws. Size: 8 7/16" X 6". Thickness: .030". Facilitates easily understood perspective drawings in construction work of refineries, gas and water distribution systems, sprinklers and other complicated piping work. 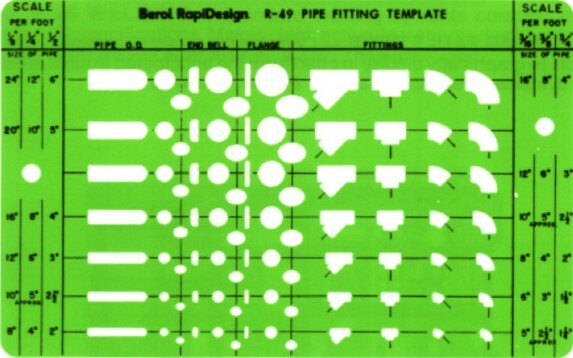 Contains symbols of all components of piping systems; valves, flages, elbows, reducers, caps and pumps. Template can be tilted three ways: one each of the three planes of a perspective view. Size: 8 ½" X 5 ¼". Thickness: .030". Conforms to ANSI y14.5M-1982 and ISO/R1101 specifications. 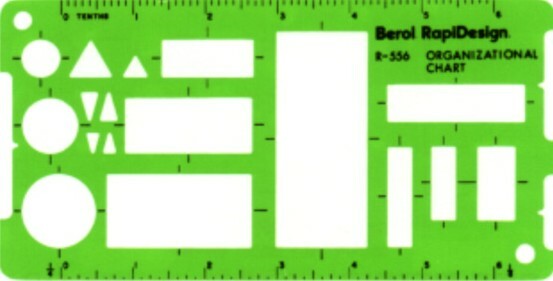 Vertical letters and numbers in 1/8" (3.5mm) size. 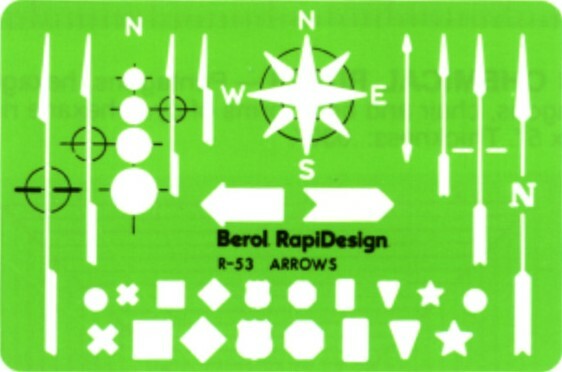 Includes arrowhead, delta, balloon and finishing symbols. Size: 7" X 2 ¾". Thickness: .030". Same as No. 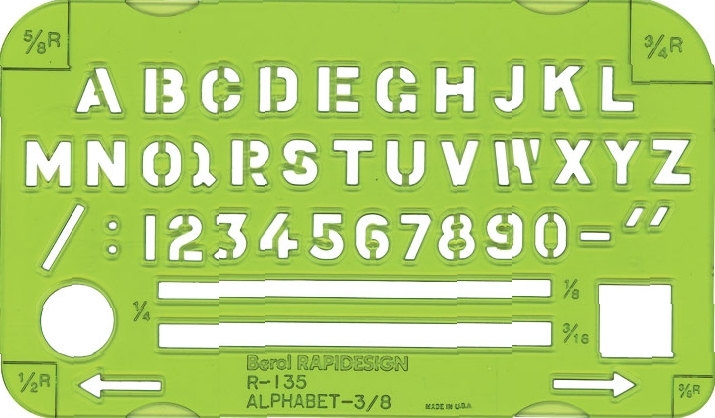 R-52 template with 5/32" (4mm) size letters and numbers. Conforms to MIL-STD 100A. Size: 7" X 2 ¾". Thickness: .030". Most commonly used symbology for telephone system layout. Includes additional related symbols to enhance usefulness. Size: 10" X 5 ¾". Thickness: .030". 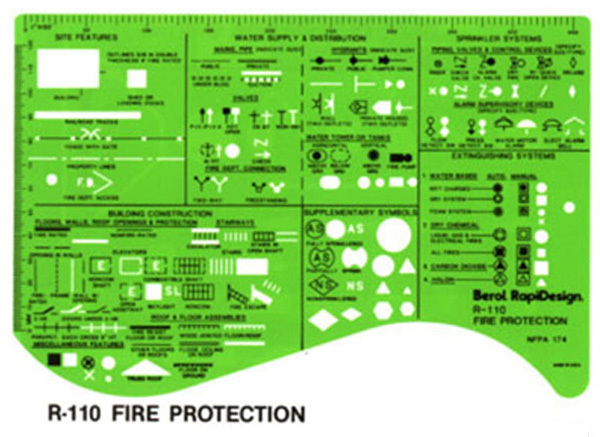 Contains standardized fire protection symbols for risk analysis diagrams, fire protection consulting, fire insurance underwriting, fire department prefire planning or for fire loss, analysis. Conforms to NFPA 174 Standard. Includes MM and 1' _ 50' scale. Size: 9 7/16" X 6 5/16". Thickness: .030". 26 radii in scales of 20', 50' and 100' to the inch. 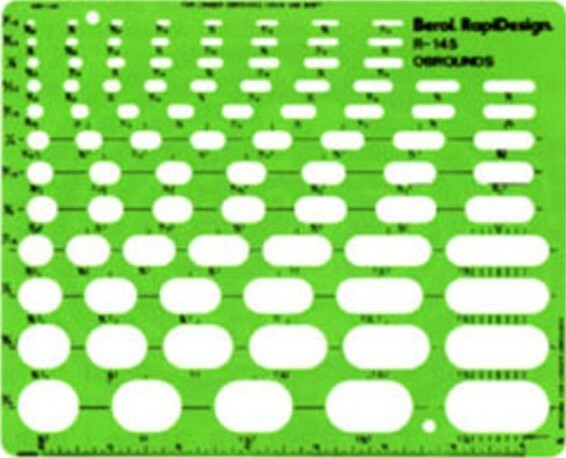 12 additional printed radii can be used for center locating. Size: 9 ½" X 7 ½". Thickness: .040". Also available in metric. No. 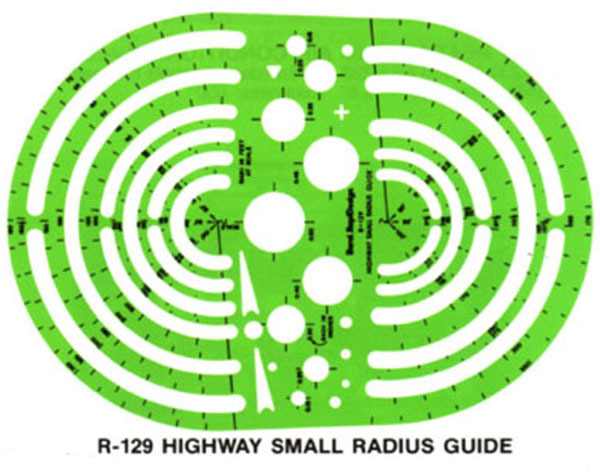 R2127. Similar to No. R-125 template, with emphasis on general accident reporting. 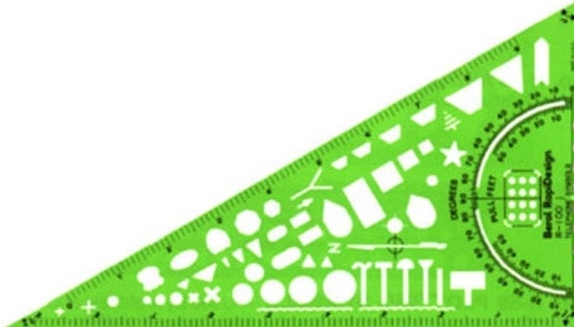 Includes 1" = 20' scale and 0o _ 90o protractor. Size: 8" X 3 3/8". Thickness: .030". Available in three sizes. For diagramming traffic accidents on reports and investigation forms. Used by local police and State Highway departments. Assures proper proportion and uniformity in description and interpretation of accident scenes. 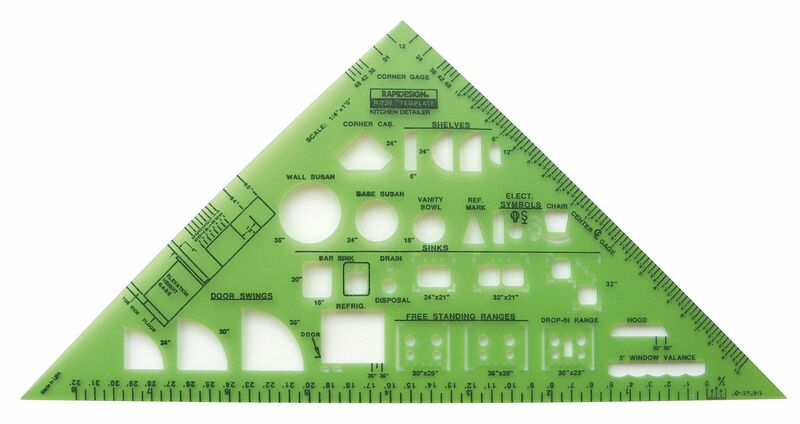 Includes 1/10" scale and 0o - 90o protractor. No. 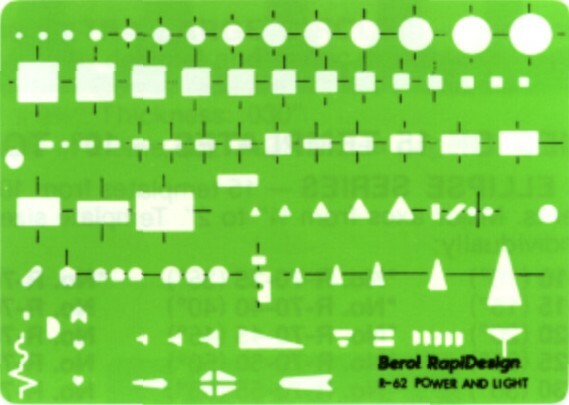 R-131 Size: 10 ¼" X 4 ½". No. R-131A Size: 7 5/8" X 3 7/16". No. R-131B Shirt pocket size: 6 3/16" X 2 13/16". For use in the traffic engineering field. 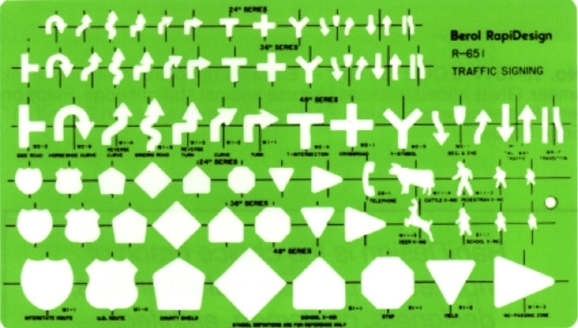 Symbols in 24", 36" and 48" scale, taken from the Federally published "Manual on Uniform Traffic Control Services" (MUTCD), to assure signing uniformity on all streets and highways in the U.S. Size: 10 3/8" X 6". Thickness: .030". All diagrammatic elements of electronic and cathode ray tubes are provided for, plus tube bases of 4, 7, and 8 prong type, in addition to all symbols in the field of electronics. Cut-outs beveled for inking. Size: 6 3/8" X 4 3/16". Thickness: .060". Portrays component parts or elements such as coils, connections, contacts, instruments, transformers, etc. 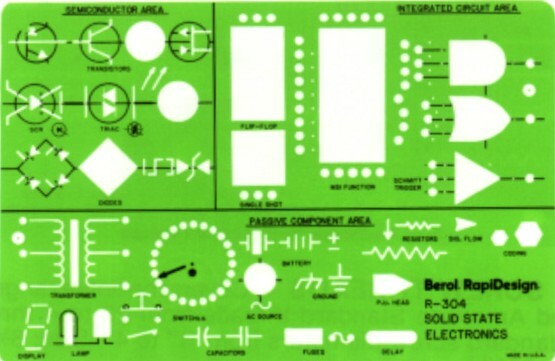 Symbols may be combined to represent complete electrical devised. Size: 6 1/16" X 3 3/16". Thickness: .030". Conforms to designs by the Bureau of Reclamation. Features symbols of equipment that carry the load from source of power to consumer. Size: 7 ½" X 5 ½". Thickness: .030". ELECTRICAL/ELECTRONIC Set of 3. 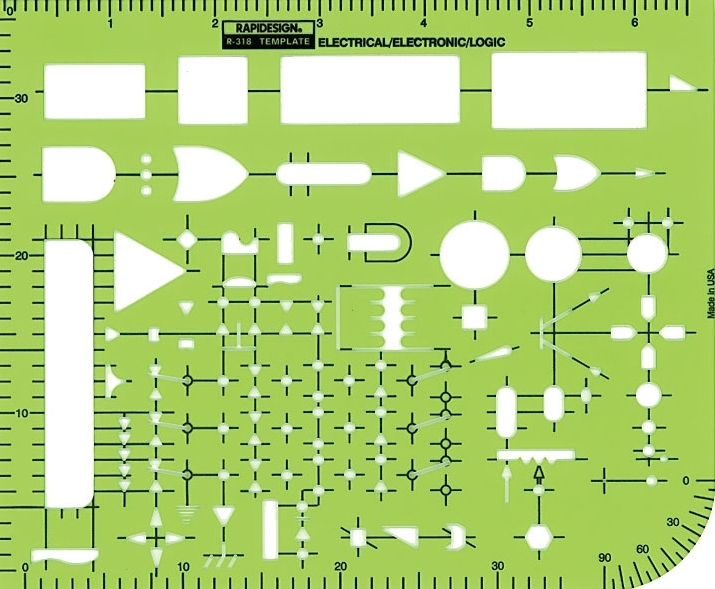 The most comprehensive set of electrical/electronic templates, taken from ANSI Y32.2 symbols, grouped into sections for easy use and are in correct relative size so any size grid can be obtained through photographic reduction. 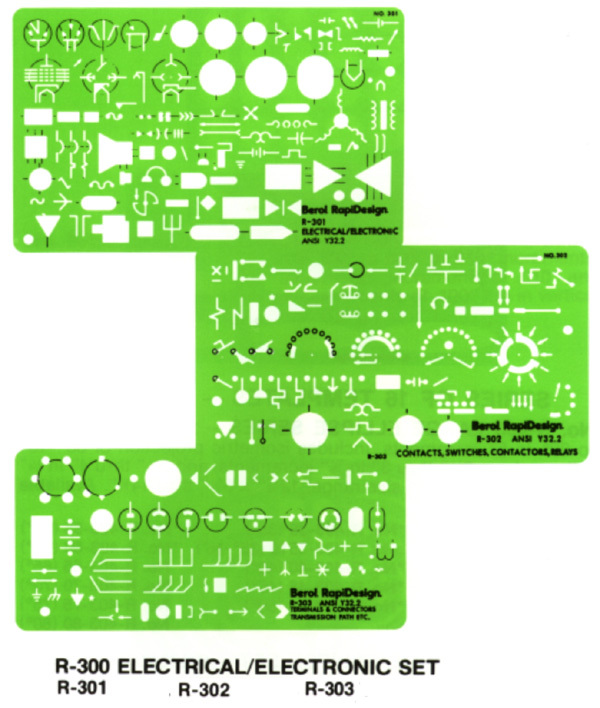 Complete set consisting of R-301, R-302 and R-303, provides nearly all electrical and electronic symbols used. R-303 TERMINALS & CONNECTORS, TRANSMISSION PATH, ETC. 3 ¾". Thickness for each: .030". 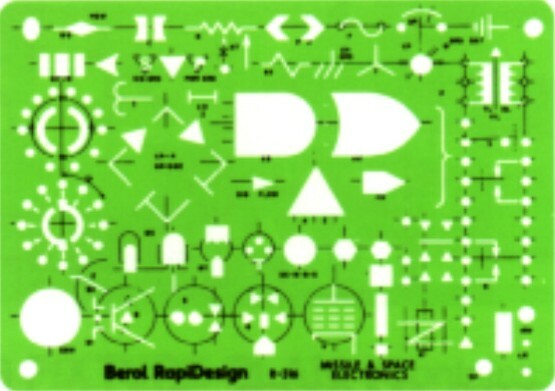 Used to generate digital logic schematics for microprocessor systems. Includes integrated circuit, semiconductor, and passive component areas. Size: 7 ½" X 5". Thickness: .030". Various sizes of AND/OR gate and inverter symbols with selected combination of electronic. MSI and IC pin layout symbols. 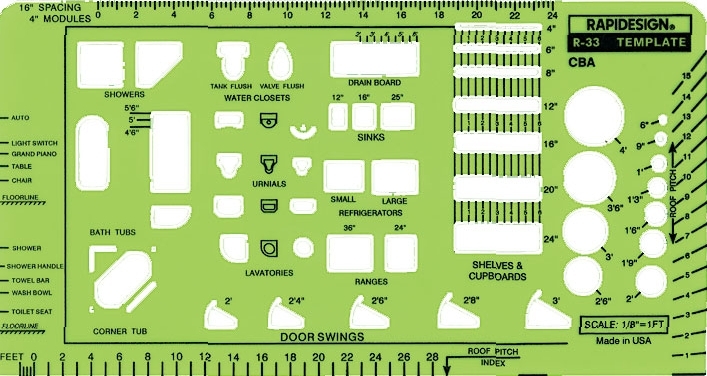 Includes 1/10" and centimeter scale. Size: 5 ¾" X 3 ¾". Thickness: .030". 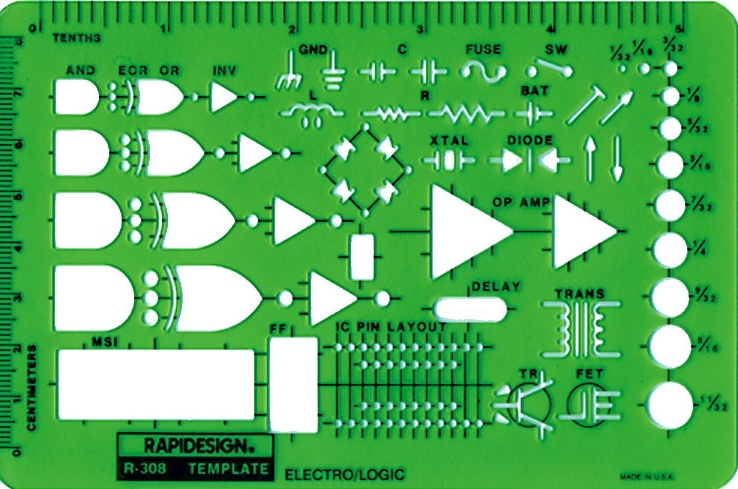 Features a combination of the most used logic and electronic symbols for quick delineation of electronic circuitry. Shirt pocket size. Size: 3 ¼" X 4 ½". Thickness: .030". Standard symbols to assist in the depiction of circuits in electrically controlled machinery and electric automation of production processes. Size: 8" X 3 ¼". Thickness: .030". Ratio: 2:1. 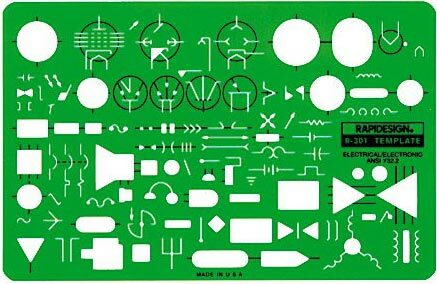 Electric and electronic symbols grouped and arranged for greatest ease in drawing. Size: 7" X 6 1/8". Thickness: .030". 250" grid. ANSI Y32.2. Same symbols as No. 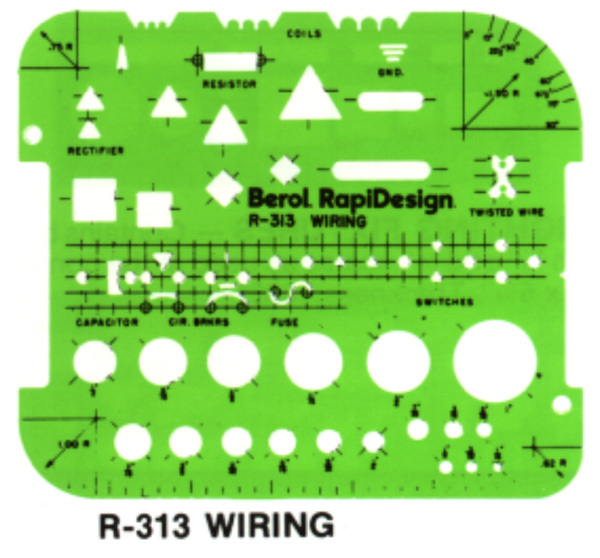 R-314 template. Cut-outs bevelled for inking. Size: 8 ¾" X 5". Thickness: .060". 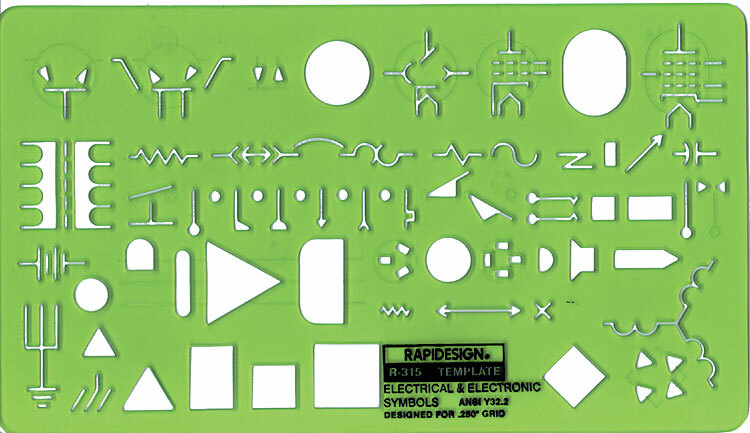 Contains symbols for electronic circuits. Size: 7" X 5". Thickness: .030". Conforms to ANSI y32.2 symbology. Based on line spacing of .15" grid. Designed for microfilming. Size: 6 7/8" X 5 5/8". Thickness: .030". 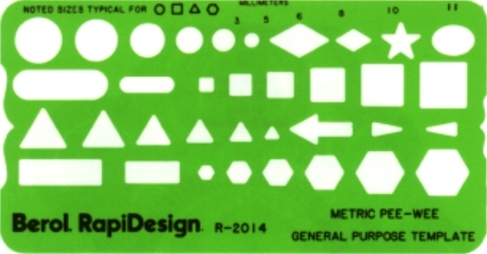 Contains basic lighting fixture symbols in 1/8" and ¼" scales as used in the construction industry. Size: 7 3/16" X 5 ¼". Thickness: .030". 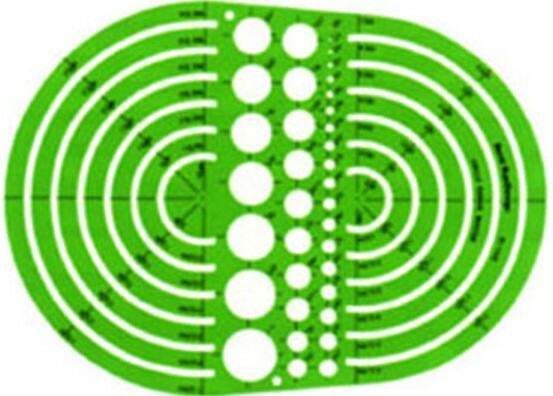 By simple combination of the various contours, all symbols in the field of electronics can be easily constructed. For radio, television and electronics. Size: 9 5/8" X 2 7/8". Thickness: .030". 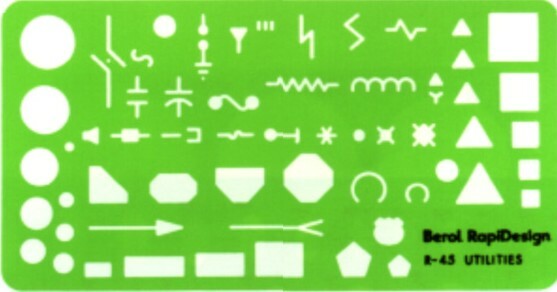 Electrical and other accepted symbols in the utility and power and light fields can be made. Cut-outs beveled for inking. Size: 8 ¼" X 45o Thickness: .030". Contains standard lavatory symbols for residential, commercial and institutional installations in ½", 3/8", ¼" and 1/8" scales. 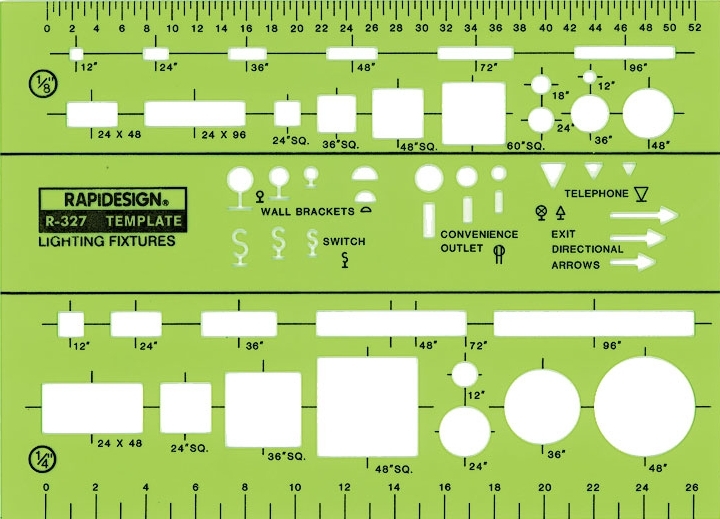 Includes 4 ¼" tile spacing in ¼" scale. Size: 9 7/8" X 5 7/8". Thickness: .020". Contains standard lavatory symbols for residential, commercial and institutional installations in ¼", 1/8" and 1/16" scales. 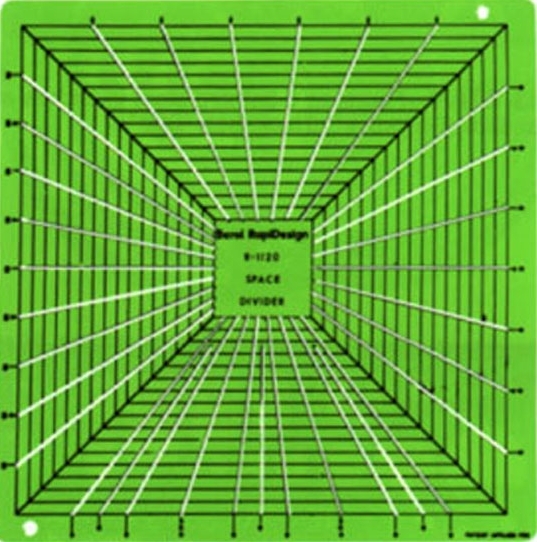 Includes 4 ¼", 6", 8" and 9" tile spacing in ¼" scale. Size: 9 ¾" X 5 7/8". Thickness: .020". Designed to facilitate layout of sheet metal conduits for heating and air conditioning. Covers all sizes between 4" and 48". Cross sections, wither round or square. Size: 9 ¾" X 5 1/16". Thickness: .030". Conforms to ASA Z32.2.3 and ASA Z32.2.4. 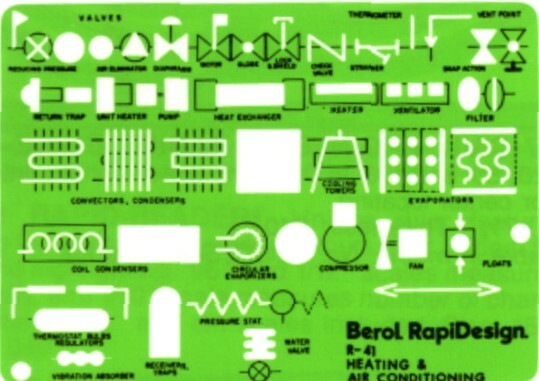 Standard symbols for heating and air conditioning. Size: 7" X 5". Thickness: .030". To facilitate process and flow planning for piping systems. 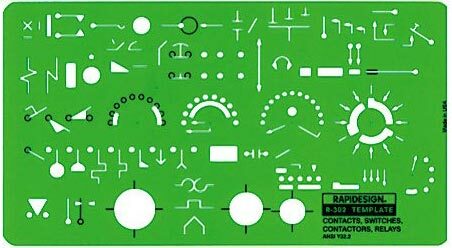 Features commonly used symbols such as data flags, pumps, jets, flow nozzles, vessel heads, etc. Includes metric scale. Size: 7 11/16" X 4 5/8". Thickness: .030". For pipe and plumbing layout; gas, oil, water or chemical. Group configurations can be constructed by sliding instrument along a straight edge. Size: 10 1/8" X 2 ¾". Thickness: .030". 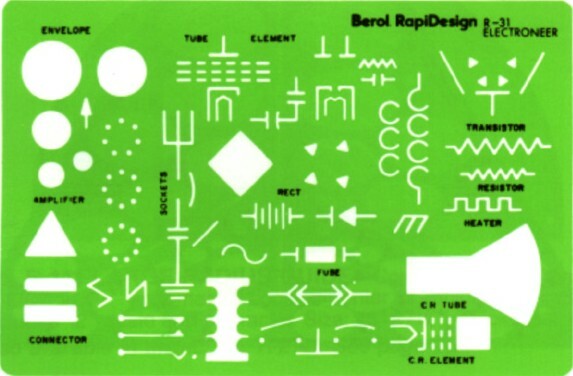 Symbols for the preparation of flow sheet diagrams in the chemical, food, petroleum, plastics and allied industries. Size: 8 3/16" X 5". Thickness: .030". No. 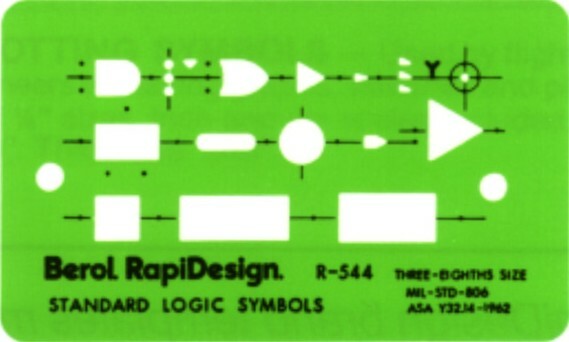 R-542 Half size symbols. Size: 5" X 3" X .060"
No. 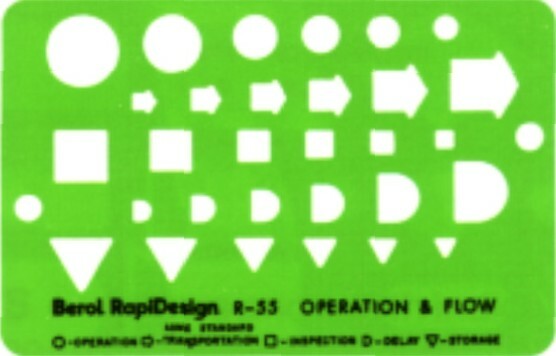 R-543 Three-quarter size symbols. Size: 6 3/8" X 3 7/16" X .030"
No. R-544 Three-eighths size symbols. 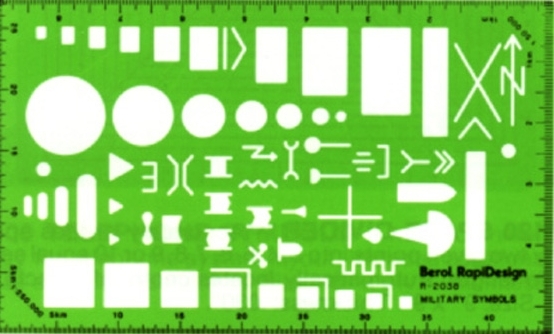 Size: 5" X 3" X .030"
Symbols for Automatic Data Processing Systems. Conforms to MIL-STD 682A and MX 3983/G. Includes 1/10", 1/6" and 1/8" scales. Size: 8" X 3 ½". Thickness: .030". Symbols used ad part of a system design methodology commonly called Structural Data Base Analysis and Design. Used to draw data flow diagramming data structure diagramming and commonly used flowchart symbols. Card volume, 1/10" and 1/6" scales included. Size 9 7/8" X 4 7/8". Thickness: .030". Contains convenient symbols for use with work simplification and flow process charting. Includes 1/8" scale on top edge. Size: 7" X 2 9/14". Thickness: .030". Conforms to ANSI Y32.10. 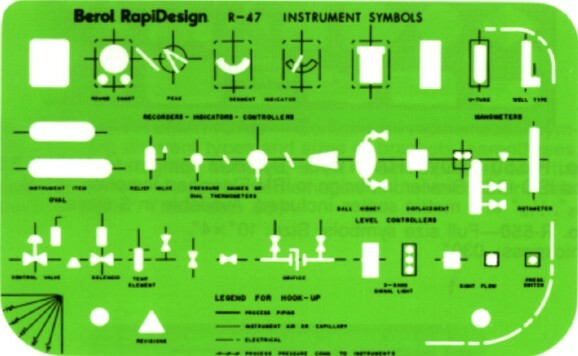 Most commonly used graphic symbols for fluid power diagramming. Inch and metric scales included. Size: 7" X 4 ½". Thickness: .030". Scale: ¼" = 1'. For architects, builders and contractors. Contains the symbols most commonly used in the profession. Includes roof pitch gauge and 16" spacing in 4" modules. Size: 9 ½" X 4 3/8". Thickness: .030". Scale: ¼" = 1'. Same symbols as No. 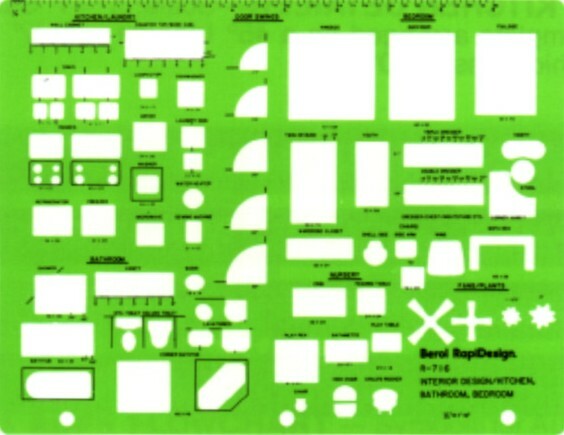 R-22 template. Size: 5 ½" X 3 ¼". Thickness: .030". Scale: ¼" = 1'. Same symbols as No. 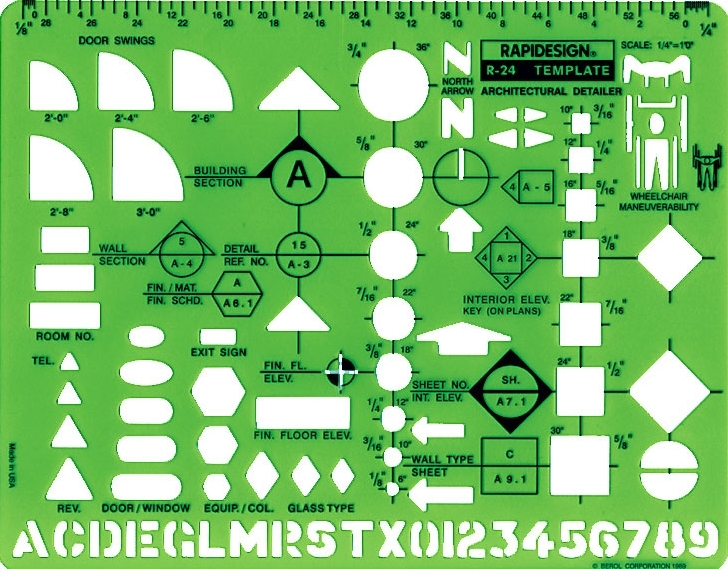 R-22 template. Size: 12" X 12". Thickness: .030". Scale: ¼" = 1'. 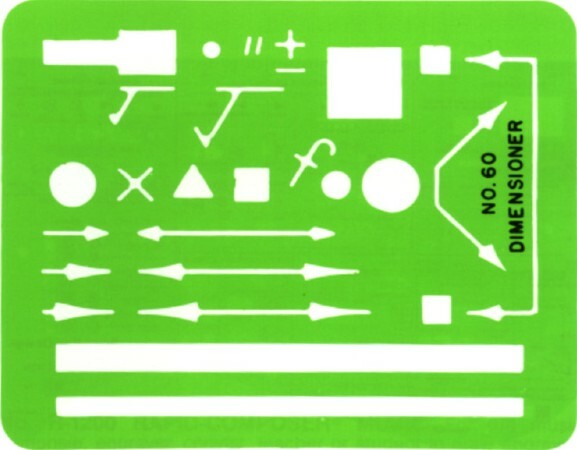 Contains commonly used symbols for architectural drawings. 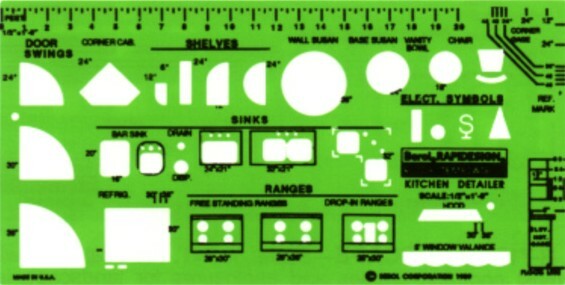 Also includes select 3/8" letters and numbers and as well as ¼" and 1/8" = 1' scales. Size: 8" X 6 ¼". Thickness: .030". Scale: ¼" = 1'. 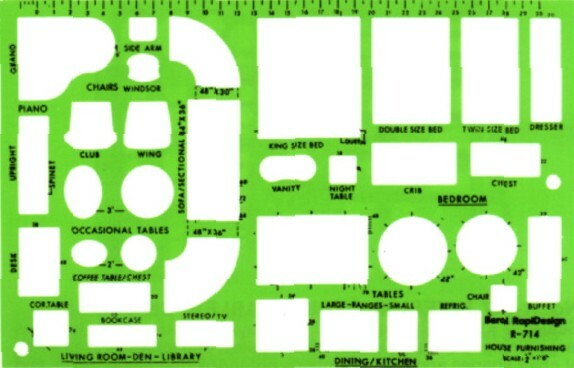 Handy and useful for the architect and building contractor. Features all of the most commonly used symbols which can be quickly and easily delineated. Includes 1/8" = 1' scale and stair step guide. Size: 10" X 2 ¾". Thickness: .030". Scale: 1/8" = 1'. For contractors, builders and architects. Includes roof pitch gauge, and 16" spacing in 4" modules. Size: 6 ¼" X 3 5/16". Thickness: .030". Scale: 1/8" = 1'. Most standard-sized office furniture and equipment. Size: 6" X 3 3/8". Thickness: .030". Scale: ¼" = 1'. For office furniture planning and arrangement. Contains desks, credenzas, files, bookcases, tables, chairs, sofas, door swings, etc. 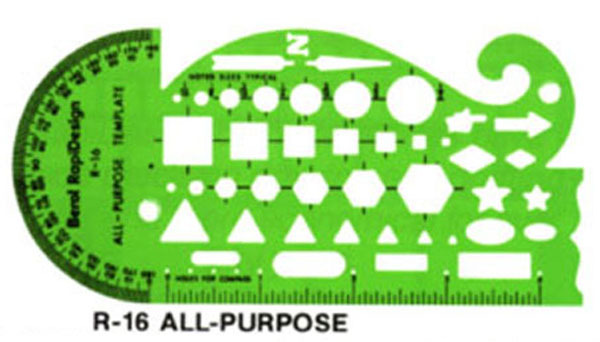 Includes ¼" and 1/8" scale on top edge. Size: 10 ¼" X 6 ½". Thickness: .030". Scale: 1/8" = 1". Same symbols as No. 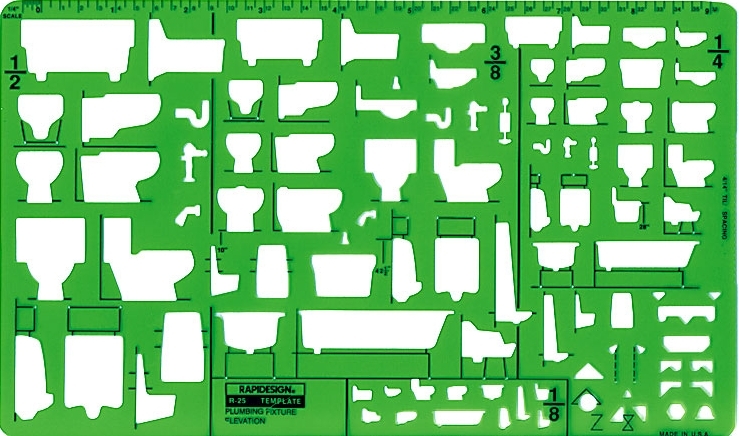 R-707 template. Size 5 ½" X 3 7/6". Thickness: .030". Scale: 1/8" = 1'. For planning banquet, seminar or conference room layouts. Includes tables, chairs, door swings, podium, projector stand, TV, etc. Table pre-spacing is provided for quick and accurate arrangements. Size: 6 1/8" X 4 1/8". Thickness: .030". 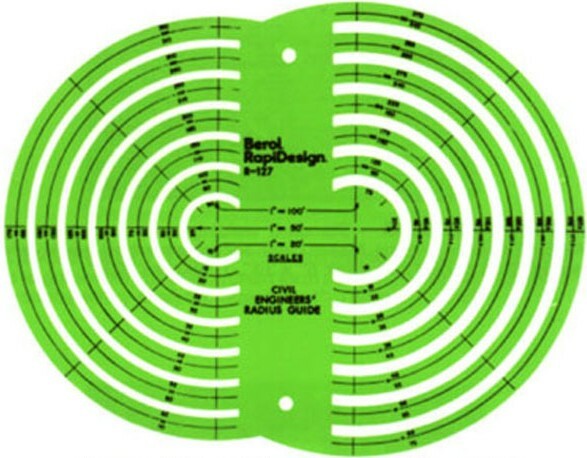 R-708 BANQUET/SEMINAR PLANNER Scale: ¼" = 1'. Same symbols as No. 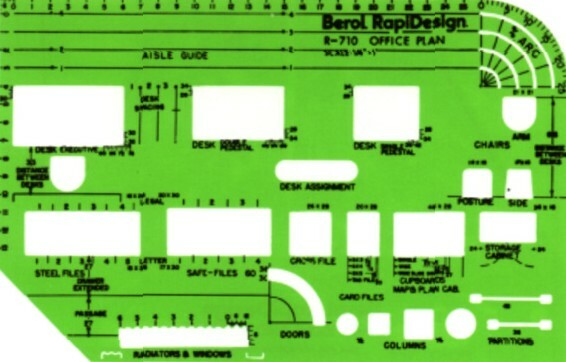 R-709 template. Size: 12 ¼" X 8 ¼". Thickness: .030". Scale: ¼" = 1'. Most standard-sized office furniture and equipment. Size: 8" X 5 1/8". Thickness: .030". Scale: ¼" = 1'. 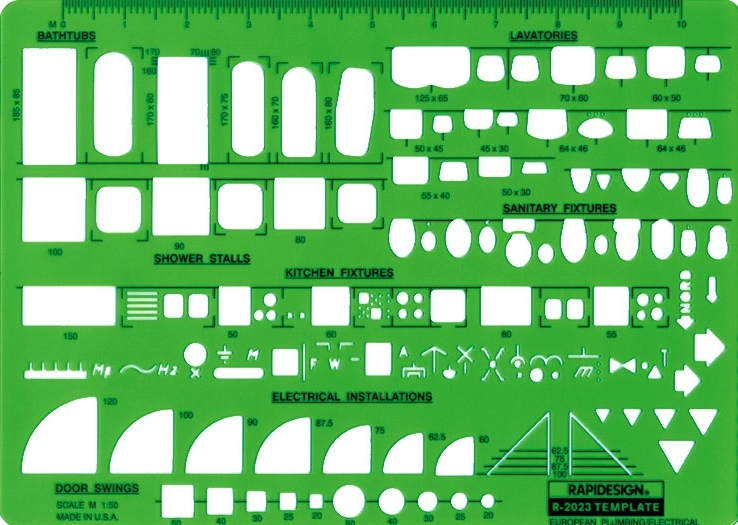 Features the most standard-sized counters and tables for use in laying out store display cases, counters, etc. Size: 9 1/8" X 5 1/8". Thickness: .030". Scale: ¼" = 1'. To plan furniture and appliance arrangement before or after house is completed or when furniture re-arrangement is contemplated. Size: 8 5/8" X 5 ½". Thickness: .030". 1/8" = 1'. Same symbols as No. 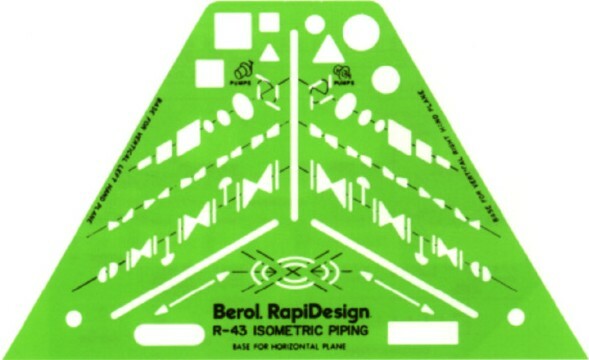 R-714 template. Size: 6" X 3 ½". Thickness: .030". Scale: ¼" = 1'. 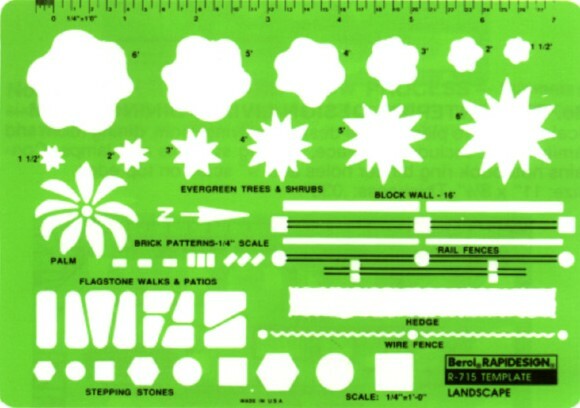 For scaled drawings of the most common shapes and enclosures for landscape layouts. Size: 8 1/8" X 5 ¾". Thickness: .030". Scale: ¼" = 1'. To plan interior design for kitchen, laundry, bedroom and nursery. Includes door swings, fans and plants. Contains notebook ring binder holes and ¼" scale on top edge. Size: 11" X 8 ½". Thickness: .030". Scale: ¼" = 1'. To plan table and chair layout for any room. Includes large dining room table sizes to the smallest end tables, and a variety of chair shapes and sizes. Contains notebook ring binder holes and ¼" scale on top edge. Size: 11" X 8 ½". Thickness: .030". Scale: ¼" = 1'. To plan interior design for living room, dining room and family room. Includes fireplace, lighting symbols and lamps. Contains notebook ring binder holes and ¼" scale on top edge. Size: 11" X 8 ½". Thickness: .030". Scale: ½" = 1'. A combination of kitchen cabinetry and appliances to aid in larger scale kitchen designs. Also contains corner gauge, elevation height gauge and ½" = 1" scale on top edge. Size 13 ¼" X 6 ¾". Thickness: .030". Scale: ¼" = 1'. 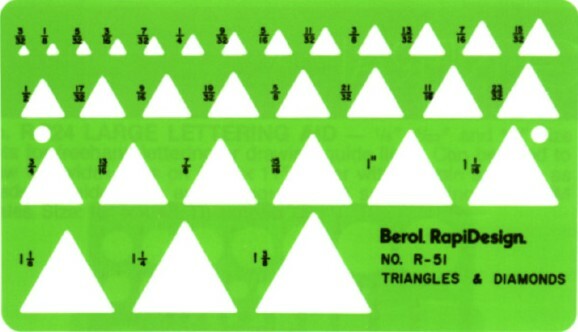 Same symbols as R-719 template arranged on a 45o triangle with ¼" scale. Size: 7" X 45o. Thickness: .030". Contains many useful symbols, including circles, squares, hexagons, triangles and rectangles in a wide range of sizes for use in general drafting or related work. Includes a 6" scale in 16ths. Size: 6 ½" X 4 ¾". Thickness: .030". Contains many useful symbols and geometric shapes. 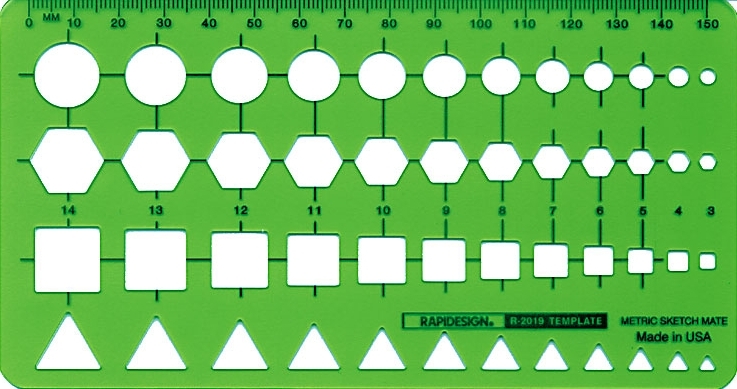 Circles, squares, triangles and hexagons from 1/8" to 7/16" in 1/16" increments. Size: 4 ¾" X 2 ½". Thickness: .020". Also available in metric, No. R-2014. 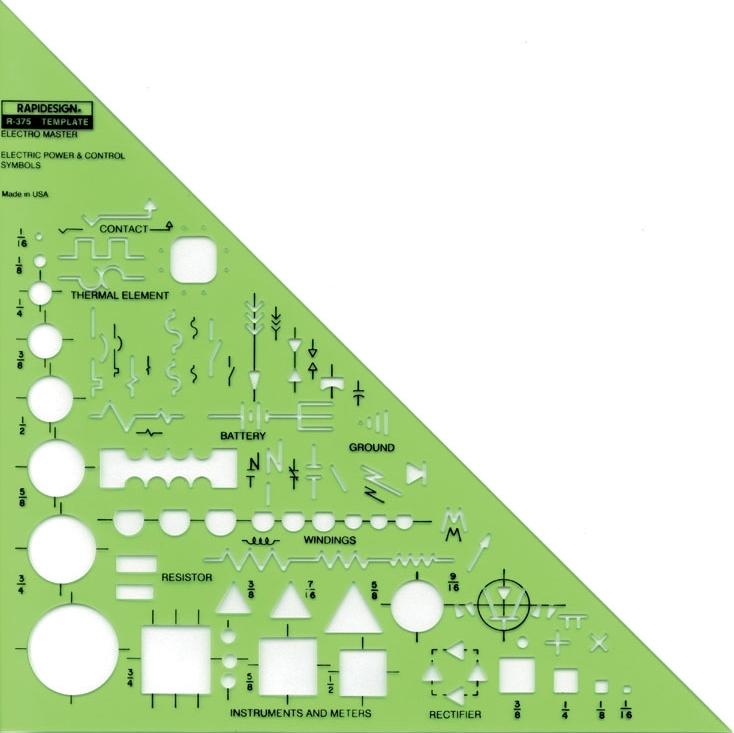 Features many useful symbols and geometric shapes, including a 3" protractor, irregular curve and a 4" scale with holes for use as a compass. 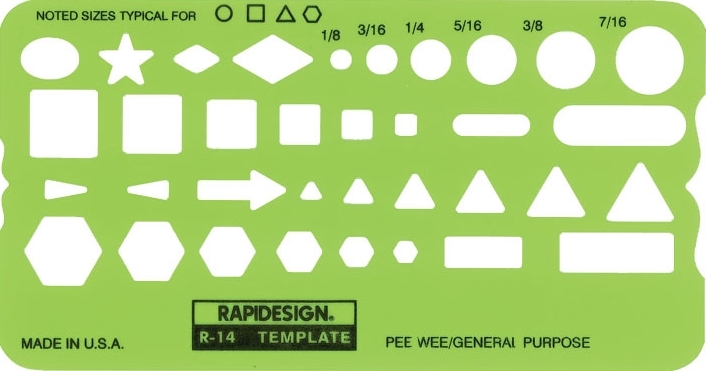 Circles, squares, triangles and hexagons from 1/16" to ½". Size: 3" X 6 1/8". Thickness: .030"
Contains most useful symbols. Circles, squares, hexes, triangles: 3 sizes and 2 styles of brackets, 2 North arrows, 2 sizes of arrowheads, 30o, 45o, 60o, 90o triangles; includes a 3" protractor and useful inch scale on bottom edge. Size: 10 ¼" X 5 ½". Thickness: .030". 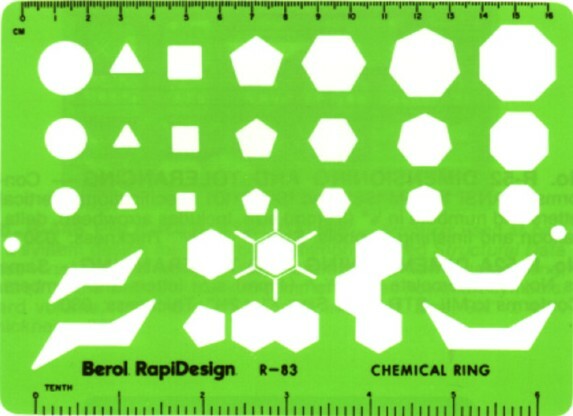 Circles, hexagons, triangles and squares from 3/32" to ½". Includes two t" scales in 10th and 16th. Size: 5 15/16" X 3 ¼". Thickness: .030". Also available in metric, No. R-2019. 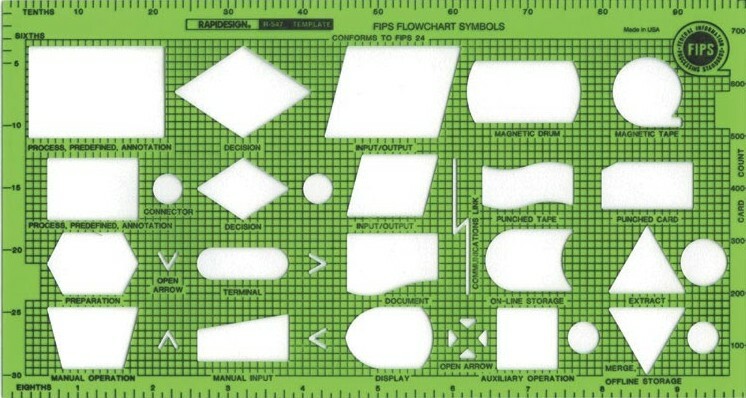 A handy, transparent pocket rule scaled in 10th and 16ths, with common cut-outs for making field sketches and other drawings. Size: 6 ½" X 1 ¾". Thickness: .030". 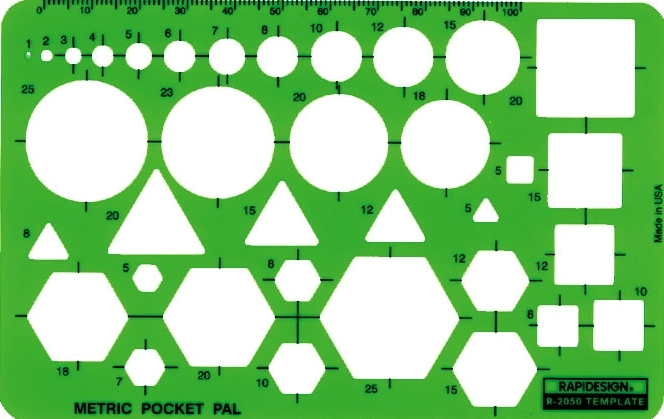 Contains the most commonly used sizes of circles from 1/32" to 1" ; hexes from 1/8" to ¾"; squares from 1/8" to 5/8", triangles from 1/8" to 5/8". Includes inch scale. Shirt pocket size. Size: 5 1/8" X 3 7/16". Thickness: .030". Also available in metric, No. R-2050. Accurately divides space between any two given points into 3, 4, 5, 6, 7, 8, 9 or 10 equal segments up to 8" in length. Automatically locates center of objects, words, lines, etc. Size: 9" X 9". Thickness: .030". For the music composer, engraver, copyist, teacher or student to draw engraved style notes, numerals and symbols. 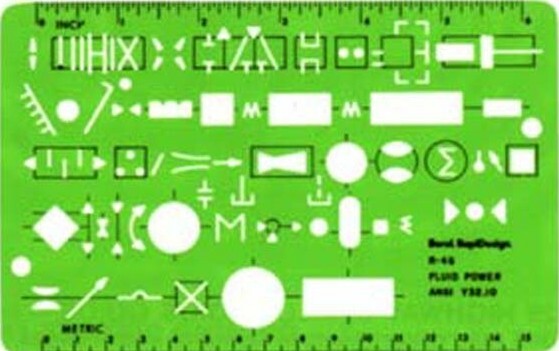 Can be used with a .7 cm or .9 cm staff size paper or staff lines can be drawn using holes. Includes 6" scale. Suitable for use with drawing pencils or with #1 technical pen. Includes instruction sheet and package of self-adhesive TEMPLIFT pads for inking. Size: 9 ½" X 4 3/8". Thickness: .030". 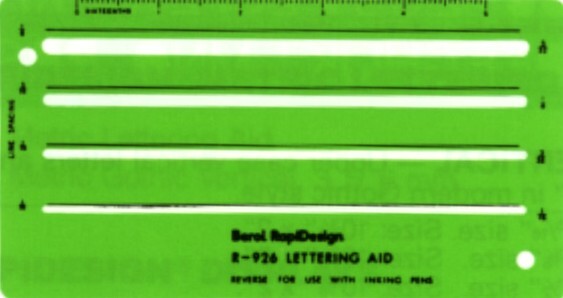 Unique ruler features center slot opening for reading computer printouts. Slot is ideal for making notations and highlighting. 1/6" and 1/12" scales measure lines per page vertically and 1/10" scale measures number of characters per line horizontally. 1/16" and cm scales included. Size: 15 ¼" X 1 ½". Thickness: .040". Contains all mathematical symbols, including different types and sizes of brackets, parentheses, root symbols, integrals, numbers, small Greek alphabet and the capital Greek letters used in mathematical and chemical formulae. Size: 6 3/16" X 2 7/16". Thickness: .030". A total of 89 obrounds ranging in size from 1/16" X 3/32" to ¾" X 1 ½". Printed lines in 1/8" increments to enable user to draw and shift for longer obrounds. Includes 1/32" scale on top edge. Size: 8 ¼" X 6 ¾". Thickness: .020". Arrows and North indicators and two sizes of traffic and road-sign markers. Size: 6" X 4". Thickness: .030". Squares from 1/16" to 11/32" in 1/64" increments; from 3/8" to ¾" in 1/32" increments; from 13/16" to 1" in 1/16" increments; from 1 1/8" to 1 3/8" in 1/8" increments. Squares up to 4" may be construction by using inch scales on sides. Size: 7 3/8" X 4". Thickness: .030". Also available in metric, No. R-2030. 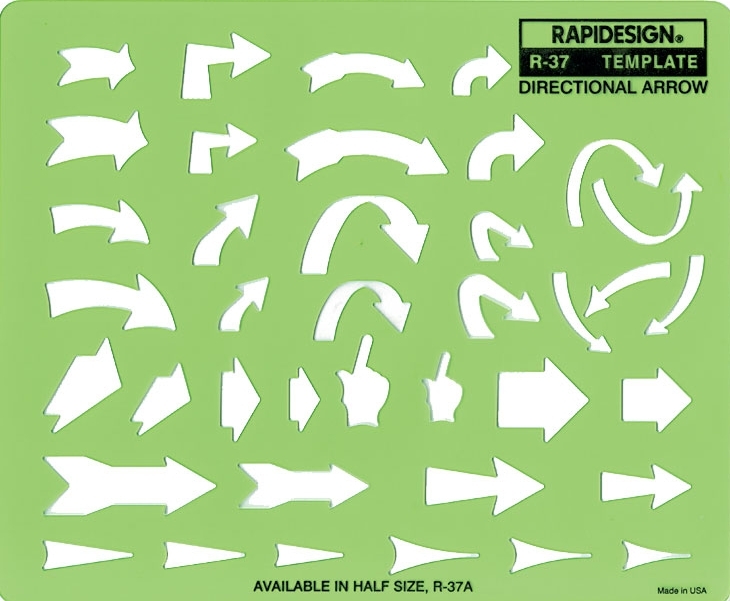 Various styles and shapes of directional arrows and pointers. Two sizes per style in most cases. Size: 8 ½" X 7". Thickness: .030". Same symbols as No. 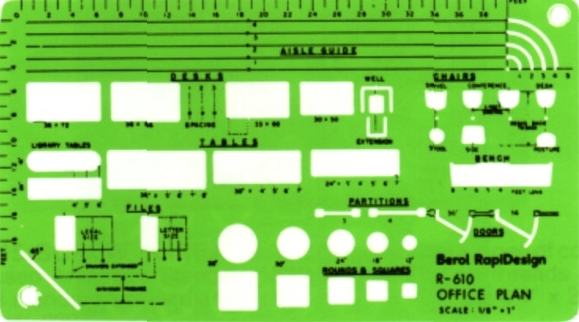 R-37 template in half-size. Size 4 ½" X 3 ¾". Thickness: .030". 30 triangles from 3/32" to 1 3/8". Diamonds up to 2 ¾" may be made by using triangles back to back. Size: 7" X 4". Thickness: .030". Also available in metric, No. R-2051. 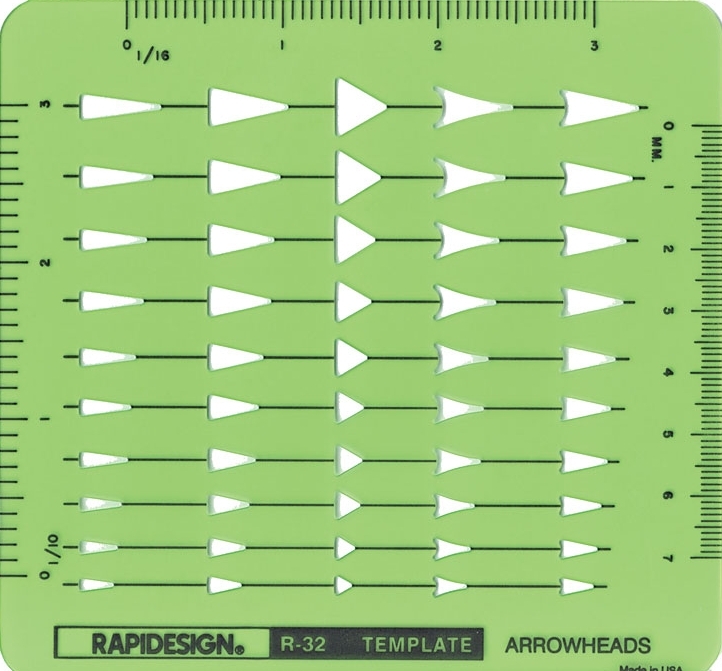 50 arrowheads, 10 sizes for each of 5 different styles. Includes 3 convenient scales: 1/10", 1/16" and mm. Size: 4 5/8" X 4 3/8". Thickness: .030". Quick, accurate way to draw radii from 1/16" up to ¾". Center automatically located when instrument is placed tangent to the two lines to be joined. Size: 4 3/8""diameter. Thickness: .030". Also available in metric, No. R-2075. Circle diameter sizes from 1/16" to 1 3/8", with 1/16" to 11/32" in 1/64" increments, 3/8" to ¾" in 1/32" increments, 13/16" to 1" in 1/16" increments and 1 1/8" to 1 3/8" in 1/8" increments. Size: 7 5/16" X 3 3/8". Thickness: .030". Also available in metric, No. R-2040. 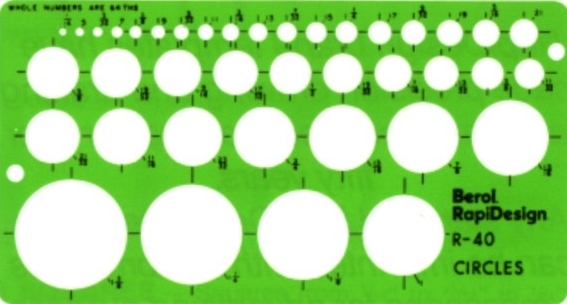 R-140 LARGE CIRCLES Contains 45 large circles, diameter sizes from 1/16" to 2 ¼" in varying increasing increments. Size: 7 3/16" X 8 3/16". Thickness: .030". Also available in metric, No. R-2140. Contains 23 radii from ¾" to 6 ½" in ¼" increments. 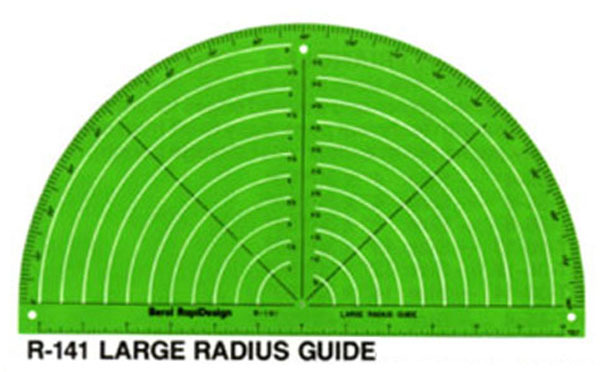 Locates centre of radius automatically. Includes 12" scale and protractor. Size: 13" X 7 ¼". Thickness: .030". 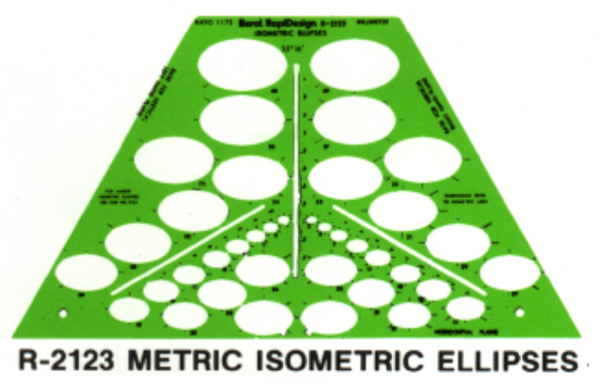 Contains 13 extra large circles with decimal and metric equivalents. 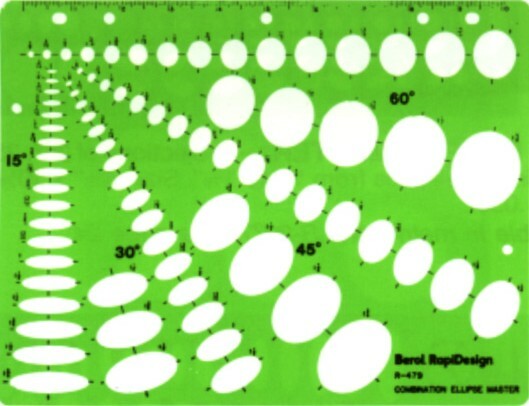 Diameter sizes from 1 ¼" to 3 ½". 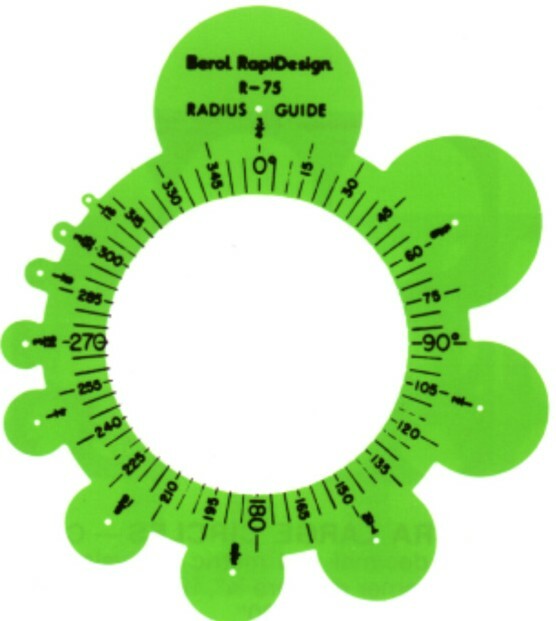 Corner radii are ¾", 7/8", 1" and 1 1/8". Size: 11 ½" X 8 ¾". Thickness: .030". Also available in metric. No. R-2440. 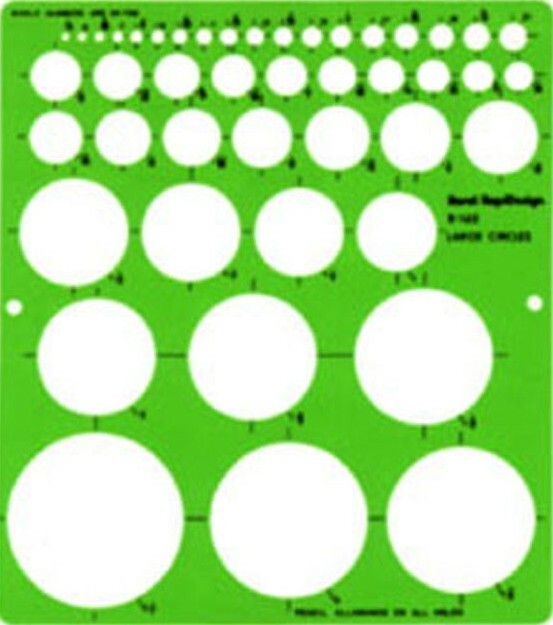 Contains 66 circles diameter sizes from .100" to 1.000", with .100" to .500" in .010" increments, and .500" to 1.000" in .020" increments. Increments of .010" and .020" are in horizontal rows and increments of .100" are in vertical rows. Size: 6 ¼" X 8 3/8". Thickness: .030". 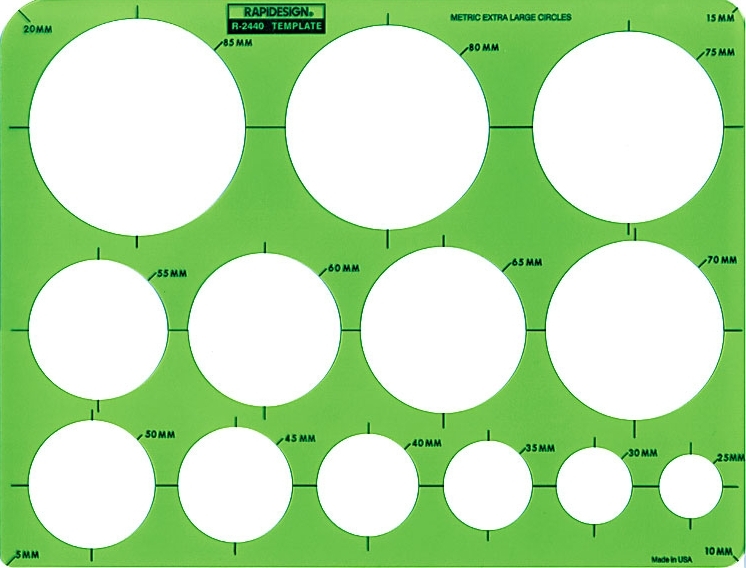 Contains 62 circle diameter sizes from 3/64" to 7 ½". Size: 7 ½" X 10 3/8". Thickness: .030". 15 templates from 10o to 80o in 5o increments. Major axes from ¼" to 2". 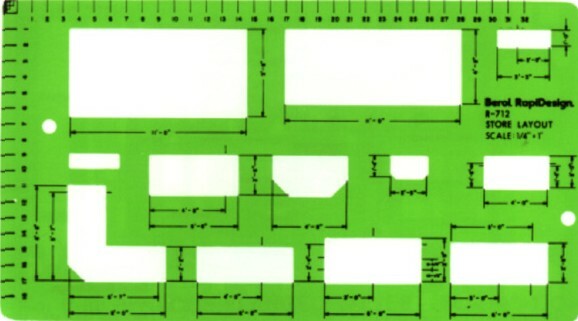 Template size: 5" X 9 7/8". 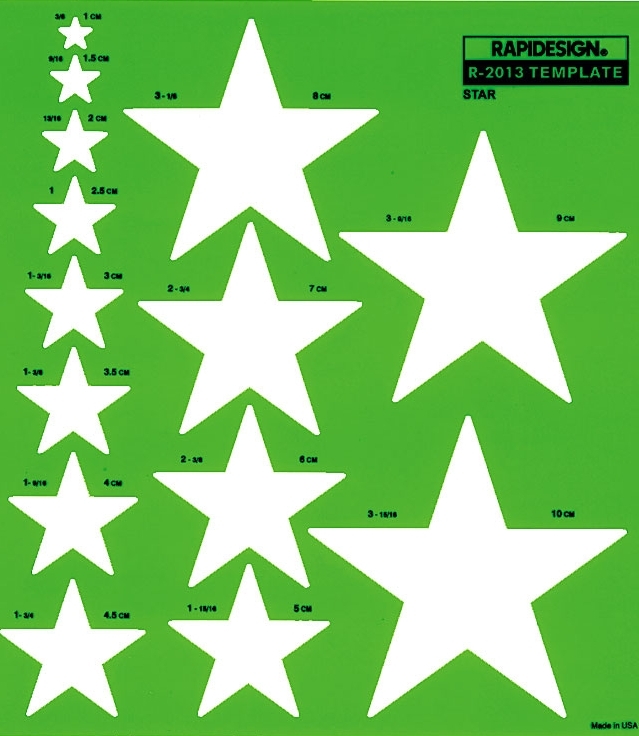 Set of 10 templates from 15o to 60o only, as asterisked (*) above. Projections of 25o, 35o, 45o and 60o. Contains 60 ellipses from ¼" to 1 3/8". Size: 4 7/8" X 10 ¼". Thickness: .030". Also available in metric, No. R-2077. Projections of 20o, 30o, 40o and 50o. Contains 60 ellipses from ¼" to 1 3/8". Size: 4 7/8" X 10 ¼". Thickness: .030". Also available in metric, No. R-2078. 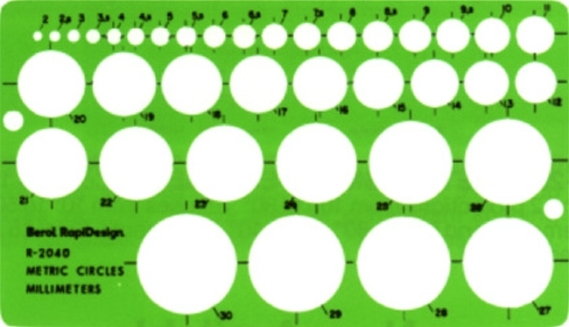 Contains 38 ellipses from 1/8" to 1 9/16" in 35o - 16o . Ingenious slot arrangement allows drawing of all three axes without turning template. Size: 11 ¼" X 6 5/8". Thickness: .030". Also available in metric, No. R-2123. 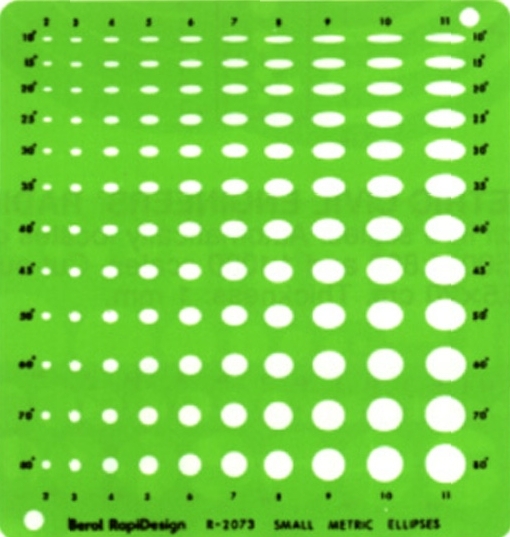 Contains 25 ellipses from 1 ½" to 2" in 1/8" increments, and 2" to 7" in ¼" increments. Dimensions are shown in halves and lined up on major axes. 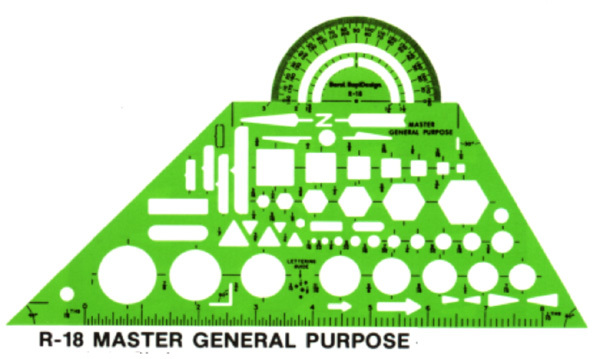 Dimensions refer to isometric axes. Size: 9 7/8" X 6 1/16". Thickness: .040". Also available in metric, No. R-2124. Contains 79 ellipses with projections of 15o, 30o, 45o and 60o. 15o projections from 3/16" to 1 5/8", 30o from1/8" to 1 ½", 45o from 1/8" to 1 ¾", and 60o from 1/8" to 1 5/8". Size: 11" X 8 ½". Thickness: .030". Projections of 25o, 35o, 45o and 60o. Contains 68 ellipses from 5 mm to 30 mm, with 5 mm to 15 mm in 1 mm increments and 15 mm to 30 mm in varying increments. Size: 12.5 X 26.5 cm. Thickness: .8 mm. Projections of 20o, 30o, 40o and 50o. 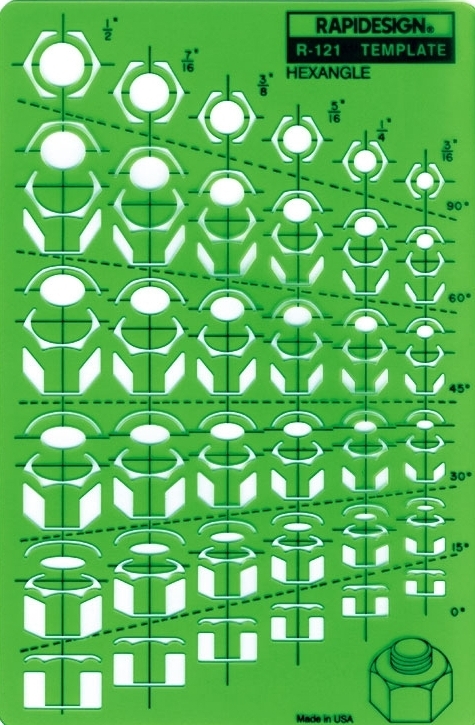 Contains 68 ellipses from 5 mm to 30 mm, with 5 mm to 15 mm in 1 mm increments and 15 mm to 30 mm in varying increments. Size: 12.5 X 26.5 cm. Thickness: .8 mm. 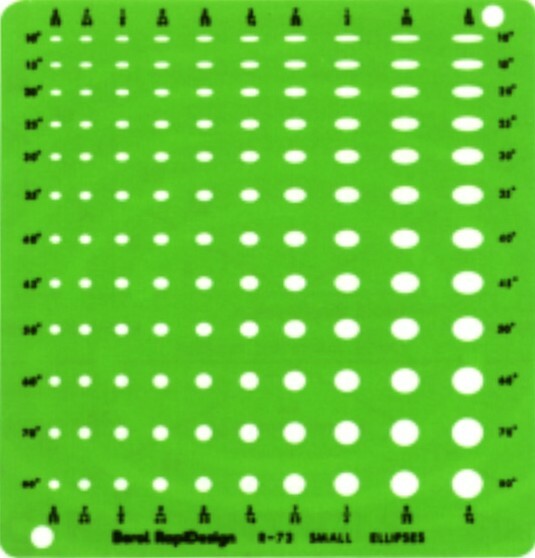 Contains 38 ellipses from 3 mm to 40 mm in 1 mm increments. Ingenious slot arrangement with mm scales allows drawing of all three axes without turning template. Size: 32.4 X 18.3 cm. Thickness: .8 mm. Contains 29 ellipses from 35 mm to 175 mm in 5 mm increments. Dimensions are drawn in halves and lined up on their major axes. 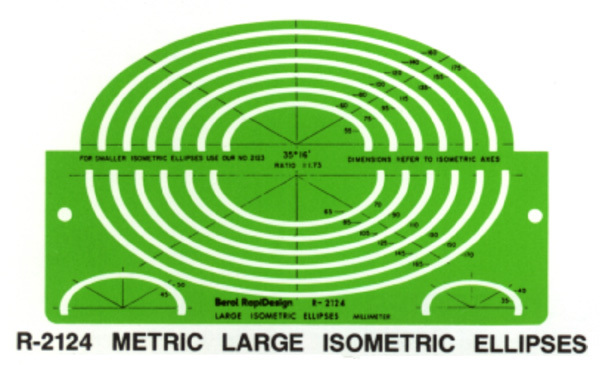 Dimensions refer to isometric axes. Size: 24.8 X 15.1 cm. Thickness: 1.0 mm. 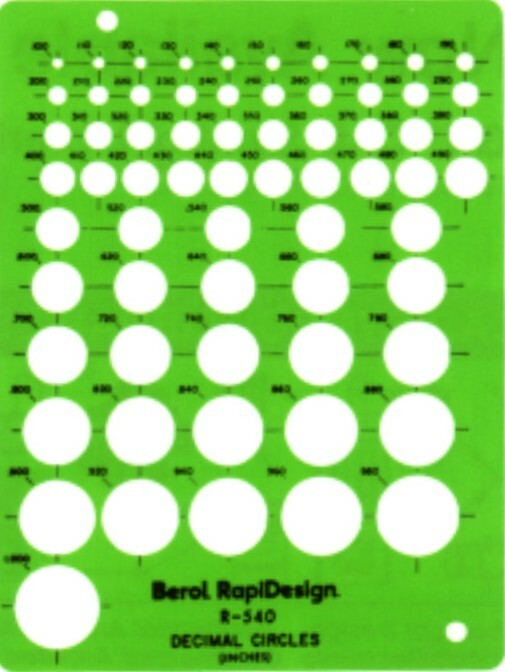 Most commonly used sizes of circles, hexagons, triangles and squares. Includes 100 mm scale. Shirt pocket size. Size: 14 X 9 cm. Thickness: .8 mm. Fourteen 5-pointed stars in inches and metric dimensions. Size 8 ½" X 9 ¼". Thickness: .030". Circles, hexagons, squares and triangles from 3 mm to 14 mm. Convenient 150 mm scale includes. Size: 16.2 X 8.8 cm. Thickness: .8 mm. Scale: 1:50. 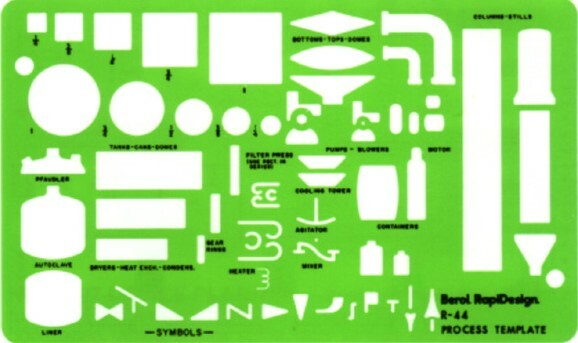 Comprehensive collection of plumbing, electrical and architectural symbols in an easy-to-use arrangement. Symbols are in true metric sizes. 10 meter scale includes. Size: 24 X 17 cm. Thickness: .8 mm. Contains 35 squares from 2 mm to 30 mm, with 2 mm to 8 mm in .5 mm increments, and 8 mm to 30 mm in 1 mm increments. Squares up to 80 mm may be constructed by using mm scales on edges. Size: 18.8 X 11.2 cm. Thickness: .8 mm. 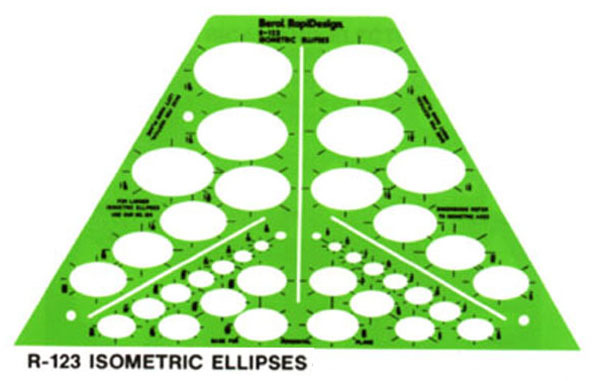 Contains 44 large metric circles, diameter sizes from 2 mm to 50 mm in varying increasing increments. Size: 18.5 X 21 cm. Thickness: .8 mm. 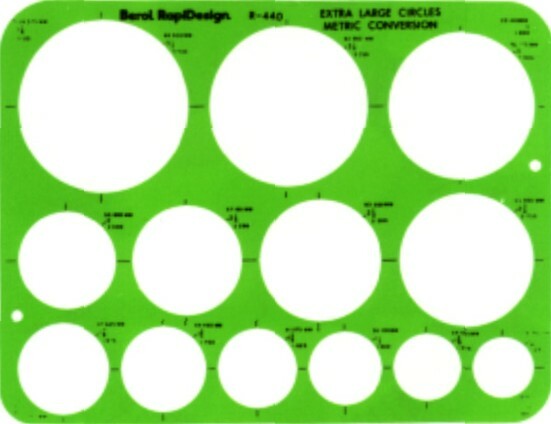 Contains 13 extra large metric circles. Diameter sizes from 25 mm to 85 mm. Corner radii are 5 mm, 10 mm, 15 mm and 20 mm. Size: 29.2 X 22.2 cm. Thickness: .8 mm. Contains 37 circles from 2 mm to 30 mm, with 2 mm to 10 mm in .5 mm increments, and 10 mm to 30 mm in 1 mm increments. Size: 18.1 X 10.2 cm. Thickness: .8 mm. 3 mm, 5 mm, 6 mm size. Upper case vertical letters and numbers in modern Gothic style with automatic equal spacing guide lines. To use, simply line up printed vertical lines with edge of previous letter. Size: 26.3 X 5 cm. Thickness: .5 mm. 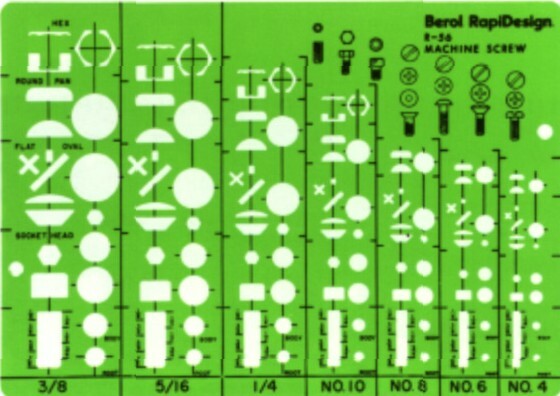 For military tactical troop formation diagramming. Features common symbols used by the Armed Forces and NATO. Size: 7 1/8" X 4 3/8". Thickness: .030"
3/8" size. Upper case letters and numbers in Block style. Guide slots featured for freehand lettering. Contains finger-lifts on edges for easy handling. Size: 6 3/8" X 3 ¾". Thickness: .060". No. R-904 1/8 size - Size 7 3/16" X 1 7/8". Thickness: .030". No. R-906 3/16 size - Size 7 3/16" X 1 7/8". Thickness: .030". No. R-908 1/4 size - Size 7 3/16" X 1 7/8". Thickness: .030". 5/32" size. Upper case vertical letters and numbers in modern Gothic style. Conforms to MIL-STD 100-A. Size 7 3/16" X 1 7/8". Thickness: .030". 5/32", 3/16", ¼" SIZE. Upper case vertical letters and number in Futura style, Light. (.035" slot). Size: 10 3/8" X 2". Thickness: 020". 1/8", 3/16", ¼" size. Upper case vertical letters and numbers in modern Gothic style with automatic equal spacing guide lines. To use, simply line up printed vertical lines with edge of previous letter. Size: 10 3/8" X 2". Thickness: .020". Also available in metric, No. R-2960. 1/8", 3/16", ¼" SIZE. Upper case letters and numbers with 1/8" lower case. Size: 10 3/8" X 2". Thickness: .020". 3/32", 5/32", 3/16" size. Upper case letters and numbers with 3/32" lower case. Size: 10 3/8" X 2". Thickness: .020". Set of three guides with 15o slant upper and lower case letters and numbers in modern Gothic style. Packaged in vinyl storage pouch. No. R-944 1/8" size. Size: 7 3/16" X 2". No. R-946 3/16" size. Size: 7 3/16" X 2". No. R-948 ¼" size. Size: 7 3/16" X 2". 1/8", 3/16",1/4" size. Upper case slanted letters and numbers in modern Gothic style. Size: 10 3/8" X 2". Thickness: .020". 5/32", 3/16", ¼" size. Upper case slanted letters and numbers in modern Gothic style. Size: 10 3/8" X 2". Thickness: .020". 1/8", 3/16", ¼" size. Upper case slanted letters and numbers with 1/8" lower case in modern Gothic style. Size: 10 3/8" X 2". Thickness: .020". 3/32", 5/32", 3/16" size. Upper case slanted letters and numbers with 3/32" lower case in modern Gothic style. Size: 10 3/8" X 2". Thickness: .020". Approved by U.S. Microfilm Association for use on drawings stored on microfilm. Assures maximum readability on blowback to any size. 1/8", 5/32", 3/16' size. 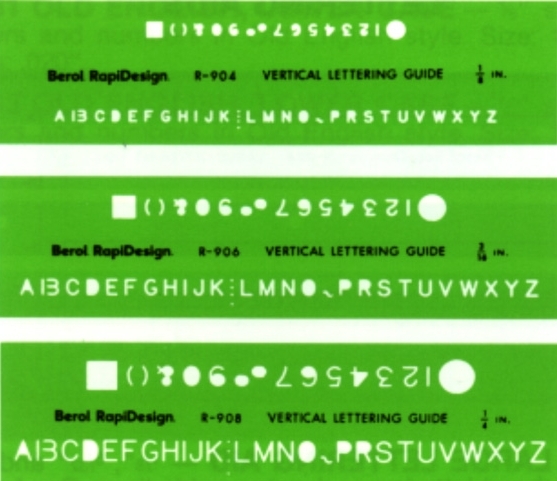 Vertical letters and numbers in Microfont style with equal spacing guide lines. Size: 11 ¼" X 2". Thickness: .020". 5/32", 3/16", ¼" size. 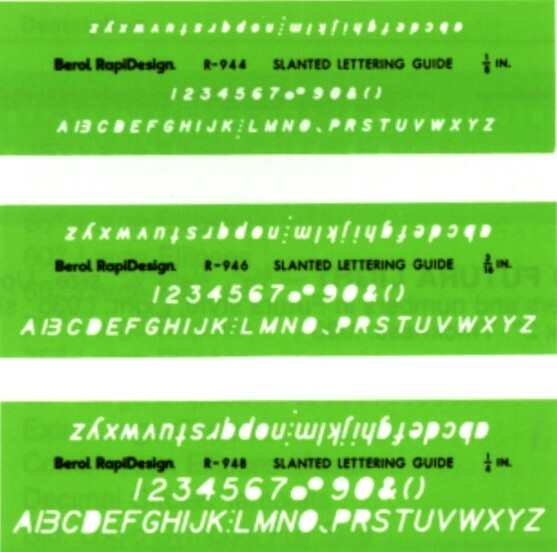 Vertical letters and numbers in Microfont style with equal spacing guide lines. Size 11 ¼" X 2". Thickness: .020". 3/8" size. Upper case letters and numbers in Old English style. Size: 10 3/8" X 2". Thickness: .020". 3/8" size. Lower case letters and numbers in Old English style. Size: 10 3/8" X 2". Thickness: .020". 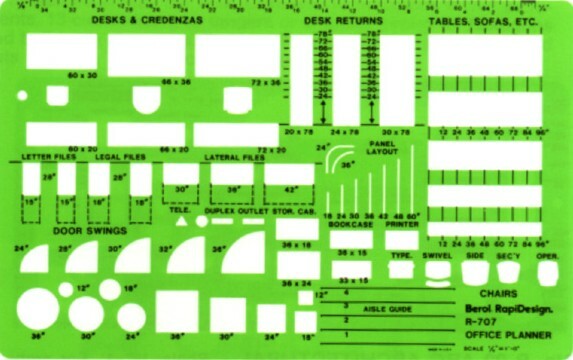 1/8", 5/32" and ¼" size slots for freehand lettering or drawing guide lines. 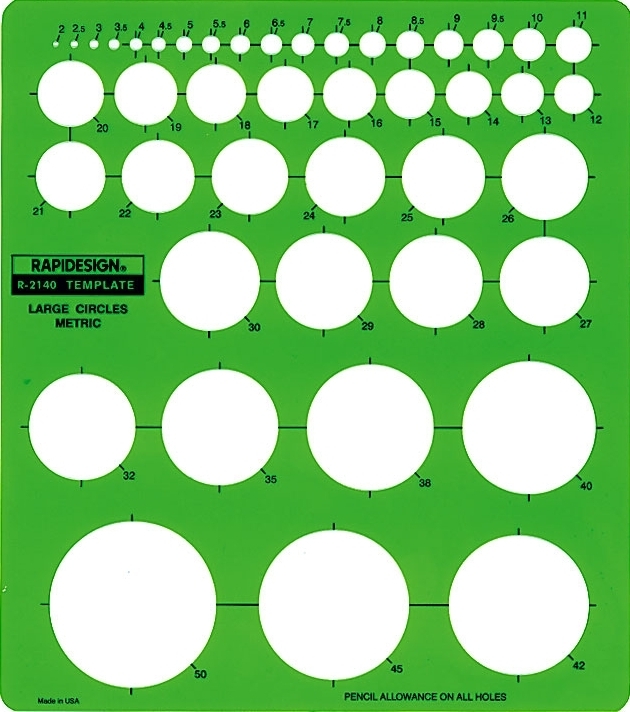 Can be used to draw full width lines on 8 ½" X 11" paper with margin spacing as needed. Guide lines are for equidistant spacing. Inch and CM scales. Size: 10" X 4 ¼". Thickness: .030". 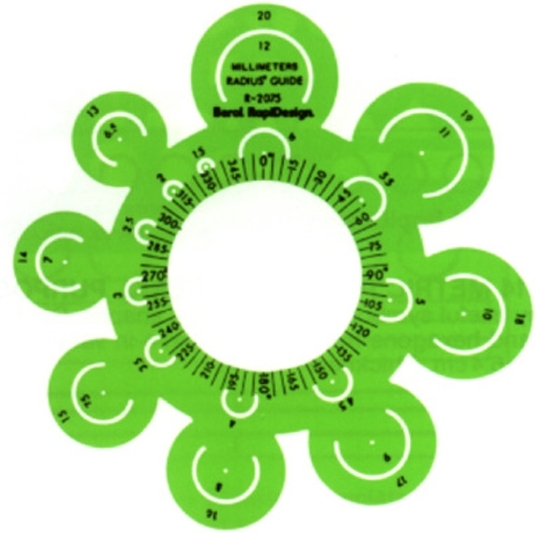 1/8", 5/32", 3/16", ¼" size slots for freehand lettering or drawing guide lines. Cut-outs beveled for inking. Guide lines for equidistant spacing. Size: 6 7/8" X 3 3/8". Thickness: .060". Also available in metric, No. R-2925. 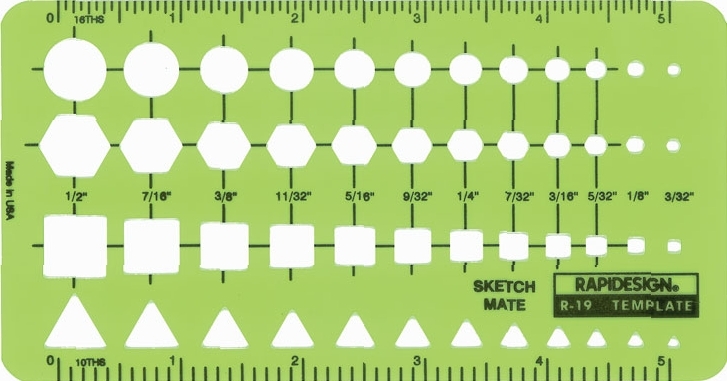 1/16", 3/32", 1/8", 5/32" size slots for freehand lettering or drawing guide lines. Inch scale included. Guide lines for equidistant spacing. Size: 7" X 3 5/8". Thickness: .030". Covers the entire range of commonly used American Standard threads from 20 to 4 threads per inch. All standard screw diameters from ¼" to 4". Size: 6 ¾" X 2 ¾". Thickness: .030". Also available in metric, No. R-2015. Conforms to ANSI B18.6.3 and ANSI B18.3 specifications. Seven common sizes in top and bottom views will make 127 different combinations including socket cap and set screws. Size: 8 ¾" X 6 ¼". Thickness: .030". For dimensioning, call-outs, and printing. 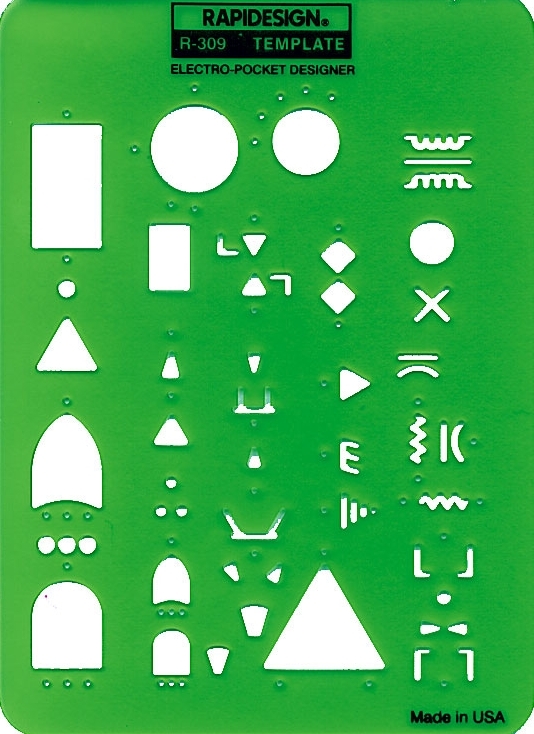 Assures neatness and uniformity in drawing micro-finish, machine-finish, plus or minus tolerance symbols, sectional arrows, zone square, dash-number arrow and circles, and other call-out symbols. Cut-outs beveled for inking. Size 3 5/16" X 4 1/16". Thickness: .060". 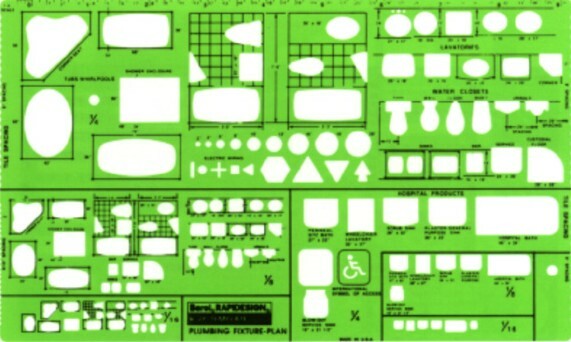 Contains 103 cut-outs. 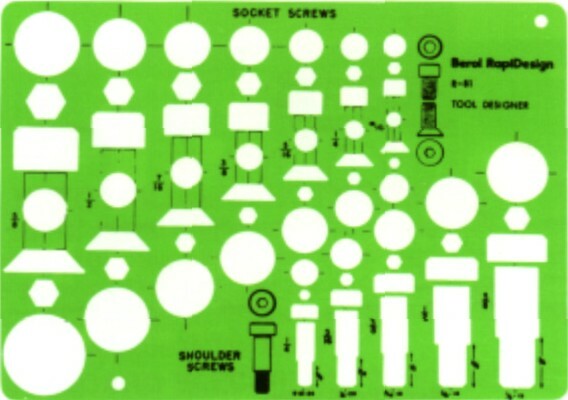 Six screw sizes from No. 10 (3/16") to ½" in elevations of 0o , 15o, 30o, 45o, 60o and 90o. 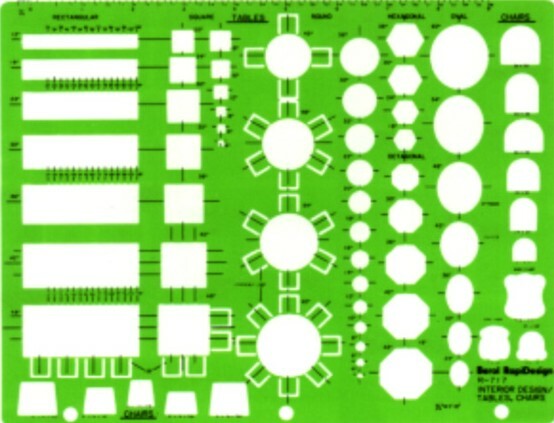 Cut-outs arranged so that chamfer circles and flats can be drawn with the hexes. Size: 5 5/8" X 8 ½". Thickness: .030". Most commonly used traffic symbols for use on insurance company and police department accident forms. Particularly useful for reporting rail accident scenes. Includes 1/10" scale. Size: 3 5/16" X 8 11/16". Thickness: .030". 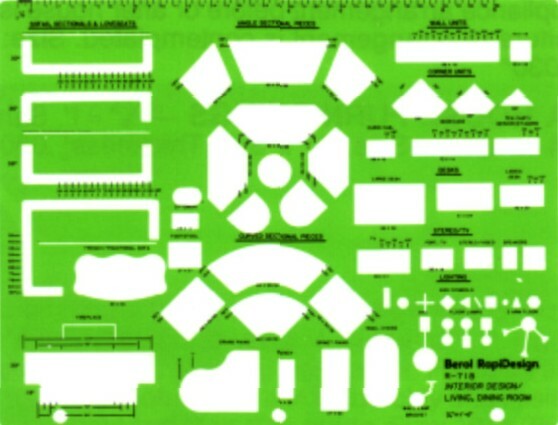 For use by highway and road departments in layout of interchanges, intersections and many other areas. 33 radii of less than 4" with scale markings at 20', 50' and 100' to the inch. Automatically locates center of each radii. Size: 7 3/16" X 10". Thickness: .030". Supplements No. 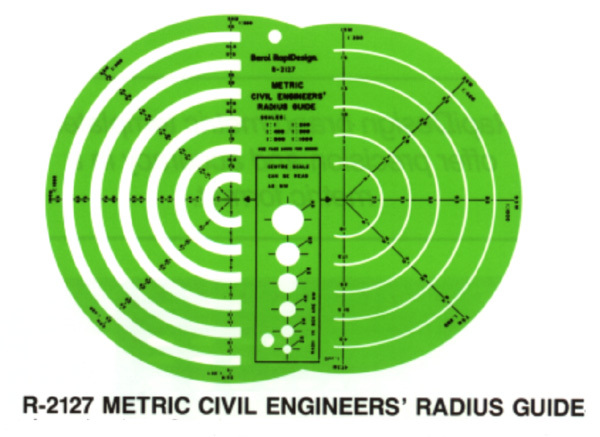 R-127 Civil Engineers' Radius Guide. See above. 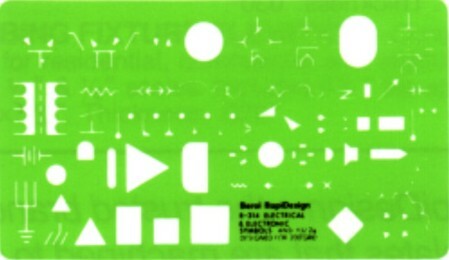 Contains electronic symbols for designers and draftsmen. Size: 7" X 5". Thickness: .030". 200" grid. ANSI Y32.2. Cut-outs beveled for inking. Size: 7" X 4". Thickness: .060". 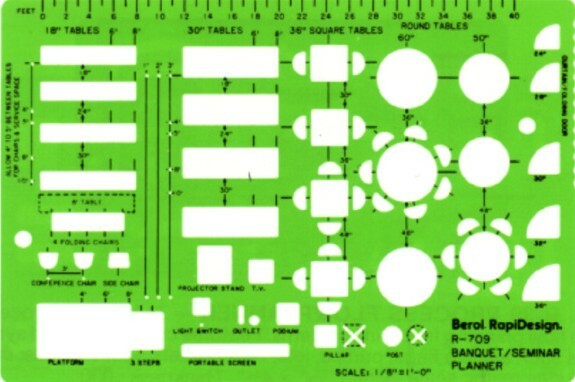 Used by flight test and data reduction engineers in making graphs, sketches and plotting curves. In 1/8", 3/16" and ¼" sizes. Inch and cm scales included. Size: 7 ½" X 1 5/8". Thickness: .020". Symbols in six most desired sizes. Can be used for operation and flow process charts in factory or office. Size: 5 1/8" X 3 3/8". Thickness: .030". Programming symbols for preparing data processing flowchart documentation in accordance with Federal Specification GG-T1837 A, ANSI X3.5, ISO 1028. Size: 10" X 5 5/16". Thickness: .030". No. 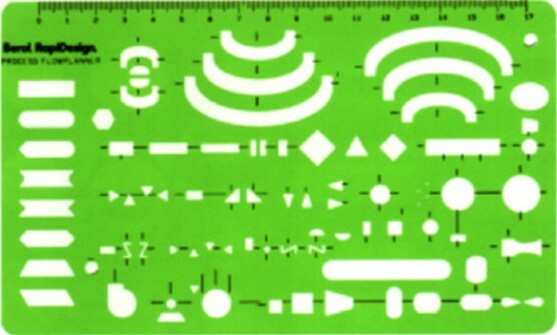 R-550 Full Size symbols. Size: 10" X 4". Thickness: .030". Contains the generally accepted symbols to graphically display in chart form the anticipated trouble areas in systems safety analysis. Size: 8" X 4". Thickness: .030". Features triangles, circles, rectangles, brackets and flow arrows used in organizational chart layouts. 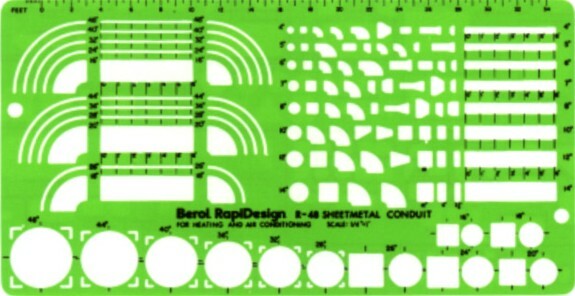 Includes ¼", 1/8" and 1/10" scales. Size: 7 ¾" X 4". Thickness: .030". 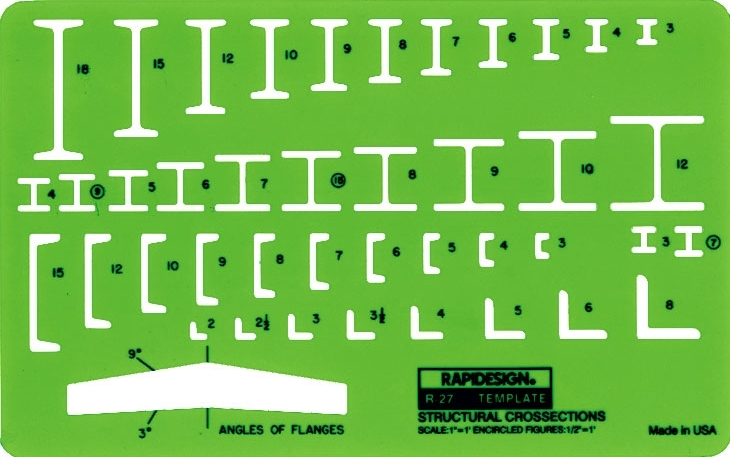 Combines 10 important scales for quickly spacing stair risers and treads, rafters, studs, joists, etc. Also an accurate architect's scale and a quick, precise calculator for computing all factors in stair planning. All scales are calibrated 1/8", ¼" and ½" to 1'. Size 3 ¼" X 9 1/8". Thickness: .030". Symmetrical bell-shaped curve used in market research, sales analysis, quality control and wherever statistics are taught or used. Includes a curve indicating confidence limits and intervals and a normal distribution table. Size: 10 ¼" X 4 ½". Thickness: .030". 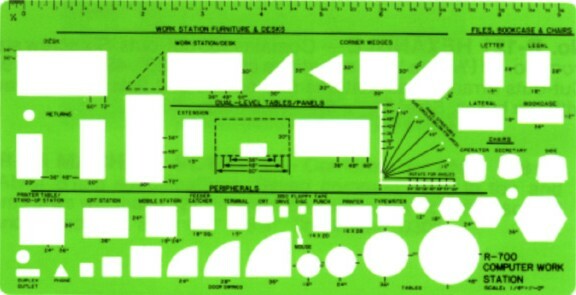 Contains most commonly used computer work station furniture and individual modules. Also includes panel structures, Files, bookcases, chairs, door swings, etc. Size: 9 ¾" X 5:. Thickness: .030". 16 templates from 10o to 80o in 5o increments. Includes isometric projection of 35o - 16'. 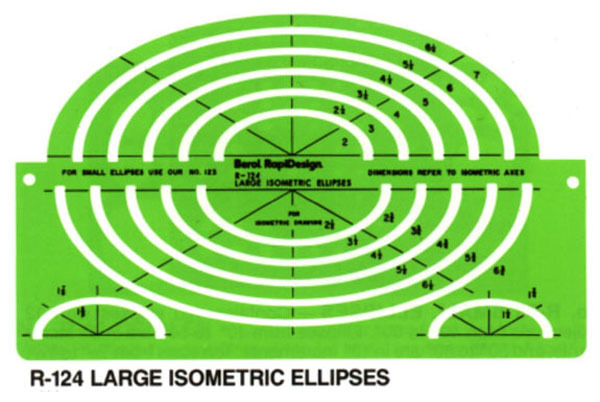 Ellipses from 2 ½" through 3" in 1/8" increments, and 3 ¼" through 4" in ¼" increments. 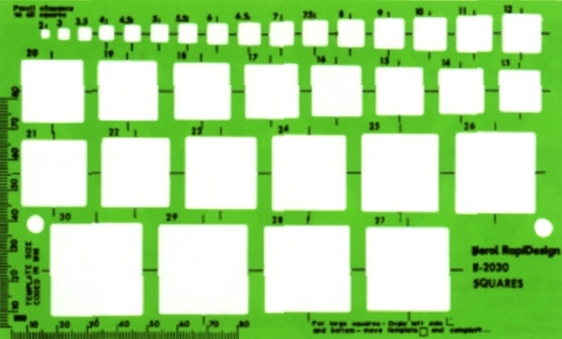 Template size range: 12 ½" X 5 5/8" through 14 ¾". 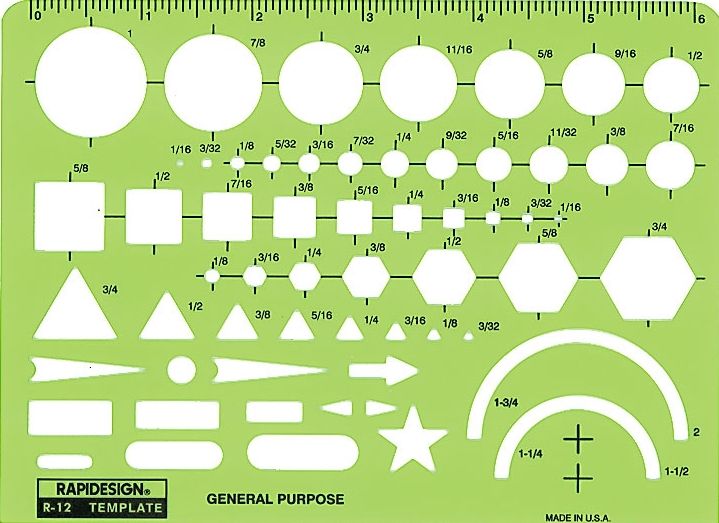 Set of 10 templates from 15o to 60o only, as asterisked (*) above. Does not include isometric projection. Packed in a heavy vinyl storage pouch. Contains 120 ellipses with 12 projections from 10o to 50o. 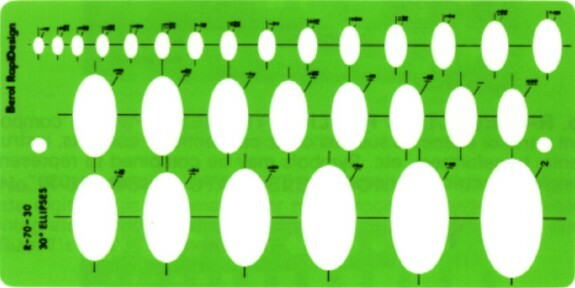 Ellipses from 10o to 50o are in 5o increments, and 50o to 80o are in 10o increments. Ten sizes from 3/32" to 5/16". Size: 6" X 6 ¼". Thickness: .020". Also available in metric, No. R-2073. Contains 120 ellipses with 12 projections from 10o to 80o . Ellipses from 10o to 50o are in 5o increments. Size 15 X 16 cm. Thickness: 5 mm. 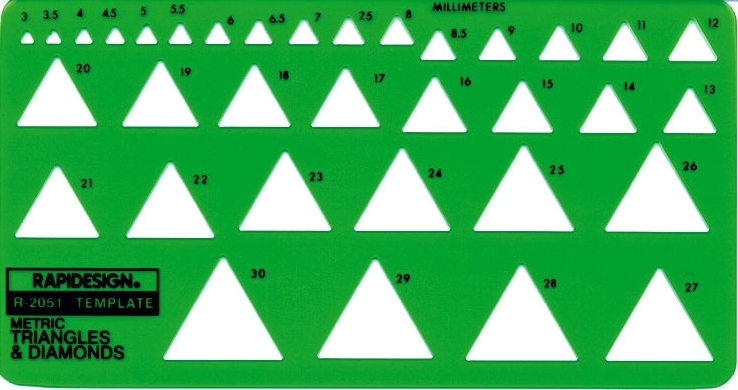 Contains 34 triangles from 3 mm to 30 mm, with 3 mm to 9 mm in .5 mm increments and 9 mm to 30 mm in 1 mm increments. Diamonds may be constructed by using triangles back to back. Size: 18.7 X 10 cm. Thickness: .8 mm. Contains many useful symbols and geometric shapes. Circles, squares, triangles and hexagons from 3 mm to 1 mm in varying increments. Size: 12.1 X 6.4cm. Thickness: .5mm. Upper case vertical letters and numbers from 5/16" to 1" in modern Gothic style. R-912 3/8" size. Size: 10 3/8" X2". R-914 ½" size. Size: 10 3/8" X 2". R-916 ¾" . Size: 12" X 2 5/8". R-918 1" size. Size: 16" X 3". Thickness: .030". 5/32", 3/16", ¼" SIZE. Upper case vertical letters and numbers in modern Gothic style with equal spacing guide lines. Size: 10 3/8" X 2". Thickness: .020"
½" size. Upper case letters in Old English style. Size: 12" X 2 ½". Thickness: .020". ½" size. Lower case letters in Old English style. Size: 12" X 2 ½". Thickness: .020". Contains 25 radii in 6 scales. Automatically locates centers. In 1:1, 1:200, 1:400, 1:500, 1:800 and 1:1000 scales. Cut-outs beveled for inking. Size: 25.5 X 20 cm. Thickness: 1 mm. Quick, accurate way to draw radii from 1.5 mm up to 20 mm, with 1.5 mm to 8 mm in .5 mm increments, and 8 mm to 20 mm in 1 mm increments. Center is located automatically when instrument is placed tangent to the two lines to be joined. Size: 14 cm approx. Thickness: .8 mm.